Raymond Archibald, (1952). "A Survey of Timber Highway Bridges in the United States," American Society of Civil Engineers. Forest Products Research Society, (1988). "Proceedings of the 1988 International Conference on Timber Engineering Volume II," International Conference on Timber Engineering 1988. United States Department of Agriculture, (1997). "Portable Crossings for Forest Roads and Skid Trails," 9724 1402 SDTDC USDA, Forest Service, Forest Poducts Lab. Forest Products Lab, (2011). "Glue-Laminated Timber: Stress-Lam Decks," USDA, Forest Service. Forest Products Lab, (2011). "Glue-Laminated Timber: Longitudinal Decks," USDA, Forst Service. (2012). "Glue-Laminated Timber Stringer Bridges," USDA, Forest Service, Forest Products Lab, Madison, WI. (2012). "Development of a Security Manual for Historic Covered Bridges," USDA, Forest Service, Forest Products Lab; FHWA, Madison, WI. United States Department of Agriculture, (1997). "Portable Crossings for Forest Roads and Skid Trails," 9724 1402 SDTDC USDA, Forest Service, Forest Products Lab, Madison, WI. Fournier, R., (2010). "A Softwood Lumber Sawmill Approach to Low-Quality Hardwoods," SmallWood 2010 Jan-40, HewSaw Machines, Hot Springs, Arkansas. Cassens, D., (2010). "Traditional Hardwood Market Structure – Opportunities for Small Producers," SmallWood 2010 19-Jan, Dept. of Forestry & Natural Resources, Purdue University, Hot Springs, Arkansas. Phares, B., Ritter, M., Wipf, T., Wood, D., (2010). "Timber Railroad Bridges," SmallWood 2010 30-Jan, National Center for Wood Transportation Structures, Hot Springs, Arkansas. Brashaw, B., Hemmila, M., (2010). "Minnesota Timber Bridge Construction – A County Perspective," SmallWood 2010 Jan-51, Natural Resources Research Institute, Hot Springs, Arkansas. Denig, J., (2010). "Kiln Drying Basics for the Small Producer," SmallWood 2010 Jan-37, Wood Products Extension, NC State University, Hot Springs, Arkansas. Hislop, L., (2010). "Pondersosa Pine Glulam Bridges in Arizona," SmallWood 2010 Jan-35, USDA, Forest Service, Hot Springs, Arkansas. Jones, P., Seale, R., Shmulsky, R., (2010). "New Structural Products from Small-Diameter Pine Trees," SmallWood 2010 13-Jan, USDA, Forest Service, Forest Products Lab, Hot Springs, Arkansas. Duwadi, S., (2010). "National Historic Covered Bridge Preservation Program," SmallWood 2010 FHWA - Federal Highway Administration, Hot Springs, Arkansas. Amburgey, T., Barnes, H., Kitchens, S., Seale, R., (2010). "Timtek: A Developing New Material for Bridges: Steam-Pressed Scrim Lumber (SPSL)," SmallWood 2010 Jan-49, Forest Products Department, Mississippi State University, Hot Springs, Arkansas. Wacker, J., (2010). "Use of Red Pine for Stress-Laminated Glulam Bridges in Wisconsin," SmallWood 2010 31-Jan, USDA, Forest Service, Forest Products Lab, Hot Springs, Arkansas. Hosteng, T., (2010). "Field Testing and Evaluation of a Demonstration Timber Bridge," Structures Congress 2010 30-Jan, Iowa State University, Ames, IA. Miller, B., (2010). "Suspension Trail Bridges Using Sustainable Materials," SmallWood 2010 Jan-48, HDR Engineering, Hot Springs, Arkansas. Rakos, C., Voyles, S., (2010). "Wood Use for Engery – Experiences and Perspectives," SmallWood 2010 Jan-32, proPellets Austria; Pellet Fuels Institute, Hot Springs, Arkansas. Patterson, D., (2010). "Hickory – Problems or Opportunities," SmallWood 2010 22-Jan, Arkansas Forest Resources Center, University of Arkansas, Hot Springs, Arkansas. Caldwell, D., (2010). "The Year at a Glance," SmallWood 2010 Hardwood Market Report, Hot Springs, Arkansas. Hilbrich Lee, P., Ritter, M., (2010). "The Use of Eastern Cottonwood for Stress-Laminated Sawn Lumber Bridges in Iowa," SmallWood 2010 Jan-50, Smith Structural Engineers; Forest Products Laboratory, Hot Springs, Arkansas. Dramm, J., Hamel, R., Mace, T., Vaagen, R., (2010). "Have Mill Will Travel: The Mobile HewSaw Demonstration," SmallWood 2010 Jan-56, USDA, Forest Service, Forest Products Lab, Hot Springs, Arkansas. Brodbeck, C., Ritter, M., Taylor, S., (2010). "Portable Timber Bridge Systems for Temporary Stream Crossings," SmallWood 2010 25-Jan, Center for Bioenergy & Bioproducts, Auburn University, Hot Springs, Arkansas. Ritter, M., (2010). "A Historical Review of the 15-year U.S. Forest Service Timber Bridge Program from a Research / Technical Perspective," SmallWood 2010 14-Jan, USDA, Forest Service, Forest Products Lab, Hot Springs, Arkansas. Phares, B., Ritter, M., (2010). "Bridge Monitoring – Security and Smart Bridges," SmallWood 2010 22-Jan, National Center for Wood Transportation Structures, Hot Springs, Arkansas. Irland, L., (2010). "The New Market Reality: Strategic Factors for U.S. Hardwoods in the Coming Decade," SmallWood 2010 28-Jan, The Irland Group, Yale University, Hot Springs, Arkansas. Cesa, E., (2010). "A Historical Review of the 15-year U.S. Forest Service Timber Bridge Program from a Utilization Perspective," SmallWood 2010 Jan-52, USDA, Forest Service, Wood Education & Resource Center, Hot Springs, Arkansas. Faller, R., Hascall, J., Kretschmann, D., Reid, W., Sicking, D., (2010). "Crash System Development and Testing of Round Guardrail Posts," SmallWood 2010 20-Jan, Midwest Roadside Safety Facility, University of Nebraska Lincoln, Hot Springs, Arkansas. Dagher, H., Davids, W., Lindyberg, R., Lopez-Andio, R., (2010). "FRP-Reinforced Glulam Bridges: Development and Implementation," SmallWood 2010 23-Jan, Dept. of Civil & Environmental Engineering, University of Maine, Hot Springs, Arkansas. Clausen, C., Lebow, S., (2010). "Bridge Durability and Preservative Issues," SmallWood 2010 28-Jan, USDA, Forest Service, Forest Products Lab, Hot Springs, Arkansas. Pelkki, M., (2010). "Financial Condition of Loggers in Arkansas," SmallWood 2010 26-Jan, Arkansas Forest Resrouces Center, University of Arkansas, Hot Springs, Arkansas. Faller, R., Kretschmann, D., Lechtenberg, K. A., Reid, J. D., Rosenbaugh, S. K., (2017). "Ponderosa Pine Round Posts as Alternative to Rectangular SYP Posts in Retrofit G4(2W) Guardrail Systems," First International Roadside Safety Conference, TR Circular E-C220 Transportation Research Board, Washington, DC. Deza, T., Phares, B., Wipf, T., (2011). "Evaluation of Techniques for Embedding and Attaching Fiber Bragg Grading Sensors to Glulam Bridge Members," Iowa State University, Ames, IA. Rammer, D., Van de Lindt, J., (2018). "Development of Seismic Performance Factors for Cross-Laminated Timber Shear Walls," RIP-4719-039 USDA, Forest Service, Forest Products Lab, Madison, WI. Hosteng, T., Phares, B., (2016). "Cost-competitive Timber Bridge Designs for Long Term Performance," USDA, Forest Service, Forest Products Lab, Madison, WI. Groenier, J., Wacker, J., (2010). "Comparative Analysis of Design Codes for Timber Bridges in Canada, the United States, and Europe," Transportation Research Record, 2200, 163-168. Brashaw, B., Hosteng, T., Wacker, J., (2011). "Field Performance of Timber Highway Bridges: A National Study." Buchanan County, Iowa, (2015). "Design and Construction of a Glued-laminated Timber Girder Bridge on GRS Abutments," USDA, Forest Service, Forest Products Lab, Madison, WI. Hosteng, T., Phares, B., Wacker, J., (2012). "Development of a Smart Timber Bridge – Phase V: Development of a Vehicle Characterization System," USDA, Forest Service, Forest Products Lab, Madison, WI. Hosteng, T., Wacker, J., (2015). "Performance Monitoring of Geosynthetic Reinforced Soil Abutment Timber Bridges," 4719-029 USDA, Forest Service, Forest Products Lab, Madison, WI. Hosteng, T., Litman, J., Smith, M., Wacker, J., (2016). "Cost-competitive Timber Bridge Designs for Long Term Performance," USDA, Forest Service, Forest Products Lab, Madison, WI. Anderson, S., Brashaw, B., (2011). "Use of Laser Scanning Technology to Obtain As-BuiltRecords of the Zumbrota Covered Bridge," NRRI/TR-20011/04 Natural Resources Research Institute, University of Minnesota, Duluth, Duluth, MN. Green III, F., (2013). "Early Detection and Eradication of Termite Infestations Destructive to Covered Bridge Structures Using Acoustic Emission," RIP-4723-019 USDA, Forest Service, Forest Products Lab, Madison, WI. Jakes, J., (2013). "Improved Understanding of Moisture Effects on Outdoor Wood-Adhesive Bondlines," RIP-4703-005 USDA, Forest Service, Forest Products Lab, Madison, WI. Phares, B., Wacker, J., (2013). "Improved Ratings for Covered Bridges through Load Testing, Phase II," RIP-4719-017 USDA, Forest Service, Forest Products Lab, Madison, WI. Fanous, F., Rammer, D., (2013). "Improved Modeling of Historic Covered Bridges, Phase IIU," RIP-4719-018 USDA, Forest Service, Forest Products Lab, Madison, WI. Jalinoos, F., Wacker, J., (2013). "Laboratory Evaluation of Advanced NDE Inspection Tools for Historic Covered Bridges," RIP-4719-020 USDA, Forest Service, Forest Products Lab, Madison, WI. Zelinka, S., (2013). "Corrosion of Fasteners in Wood Treated with Newer Wood Preservatives," FPL-GTR-220 USDA, Forest Service, Forest Products Lab, Madison, WI. Blodget, A., Clausen, C., Kirker, G., Lebow, P., (2013). "Evaluating Naturally Durable Wood Species for Repair and Rehabilitation of Above-Ground Components of Covered Bridges," FPL-GTR-224 USDA, Forest Service, Forest Products Lab, Madison, WI. Anderson, S., Brashaw, B., Vatalaro, R., (2012). "Use of Laser Scanning Technology to Obtain As-Built Records of Historic Covered Bridges," FPL-RP-669 USDA, Forest Service, Forest Products Lab, Madison, WI. Hosteng, T., Phares, B., Sievers, R., Wipf, T., (2013). "Covered Bridge Security Manual," FPL-GTR-223 USDA, Forest Service, Forest Products Lab, Madison, WI. Kretschmann, D., Wiedenhoeft, A., (2014). "Species Identification and Design Value Estimation of Wooden Members in Covered Bridges," FPL-GTR-228 USDA, Forest Service, Forest Products Lab, Madison, WI. Hosteng, T., Phares, B., Wacker, J., (2011). "Development of a Smart Timber Bridge – Phase IV: Development of Data Processing Techniques for Determining Changes in Structural Stiffness." Hosteng, T., Ritter, M., Williams, C., (2012). "Design and Demonstration of a Timber Bridge with Improved Deck Details: Phase II." Hosteng, T., Ritter, M., Wacker, J., (2015). "National Center for Wood Transportation Structures – Phase IV," USDA, Forest Service, Forest Products Lab, Madison, WI. Development of Cost-Effective Timber Bridge Repair Techniques for Minnesota. Brashaw, B., Dahlberg, J., Phares, B., Wacker, J., (2013). "Development of Cost-Effective Timber Bridge Repair Techniques for Minnesota.."
Brashaw, B., Hosteng, T., Wacker, J., (2013). "Development and Integration of Advanced Timber Bridge Inspection Techniques for NBIS." Faller, R., Halloway, J., Pfeifer, B., Ritter, M., Rosson, B., (1992). "Performance Level 1 Bridge Railings for Timber Decks," Jan-36, USDA, Forest Service, Forest Products Lab, Madison, WI. Faller, R., Post, E., Ritter, M., (1990). "Vehicular Railing Systems for Timber Bridges: A Program Overview," Wood Design Focus 5-Apr, USDA, Forest Service, Forest Products Lab, Madison, WI. Faller, R., Post, E., Ritter, M., (1991). "Crashworthy Railing Systems for Timber Bridge Decks," Structures Congress '91 540-543, USDA, Forest Service, Forest Products Lab, Madison, WI. Post, E., Ritter, M., (1988). "Study Plan: Development of Vehicular Railing Systems for Timber Bridge Decks by Full-Scale Crash Testing," USDA, Forest Service, Forest Products Lab, Madison, WI. AASHTO, (1989). "Guide Specifications for Bridge Railings," American Association of State Highway and Transportation Officials. Michie, J., (1981). "Recommended Procedures for the Safety Performance Evaluation of Highway Appurtenances," National Research Council. Federal Highway Administration, (1988). "Guardrail Transitions," US Department of Transportation. Bryant, (1997). "Public Roads Magazine," Winter 1997, 68, Federal Highway Administration. Phares, B., Wacker, J., (2010). "Development of a Smart Timber Bridge – Moisture Sensor Investigation for Historic Covered Bridges," 4719-012, 2, USDA, Forest Service, Forest Products Lab, Madison, WI. Martinson, K., Smith, M., (2010). "Glued-Laminated Timber BridgeInstallation Videos," 3333-017, 2, USDA, Forest Service, Forest Products Lab, Madison, WI. Fanous, F., Ritter, M., Wipf, T., (2010). "Live Load Distributionon Longitudinal Glued-Laminated Timber DeckBridges," FPL-GTR-194, 17, USDA, Forest Service, Forest Products Lab, Madison, WI. Fanous, F., May, J., Ritter, M., Wipf, T., (2011). "Live-Load Distribution on Glue-Laminated Timber Girder Bridges," FPL-GTR-197 USDA, Forest Service, Forest Products Lab, Madison, WI. Jalinoos, F., Wacker, J., (2011). "Field Performance of Timber Bridges: A National Study," RIP-4719-013 USDA, Forest Service, Forest Products Lab. Pilon, J., (2002). "Best Management Practices for the Use of Preservative-Treated Wood in Aquatic Environments in Michigan," Michigan Timber Bridge Initiative, Lansing, MI. Phares, B., Ritter, M., Wipf, T., (2012). "Literature Review and Assessment of Nanotechnology for Sensing of Timber Transportation Structures Final Report," FPL-GTR-210 USDA, Forest Service, Forest Products Lab, Madison, WI. Amburgey, T., Barnes, M., Kirker, G., Lebow, S., Morrell, J., Sanders, M., White, R., (2012). "Guide for In-Place Treatment of Wood in Historic Covered and Modern Bridges," FPL-GTR-205 USDA, Forest Service, Forest Products Lab, Madison, WI. Dahlberg, J., Hosteng, T., Phares, B., Ritter, M., (2011). "Evaluation of Fleet Management Techniques for Timber Highway Bridges," FPL-GTR-198 USDA, Forest Service, Forest Products Lab, Madison, WI. American Forest and Paper Association, (1991). "Award Winning Timber Bridges," American Forest and Paper Association, Washington, D.C..
Tom Williamson, (2002). "Timber Bridges 2002 Award Winners," The Engineered Wood Association, Tacoma, WA. United States Department of Agriculture, (2010). "Forest Products Laboratory Business Plan : Progress Through Partnerships," USDA, Forest Service, Forest Products Lab, Madison, WI. Roxanne Ward, (2009). "Tackle Climate Change – Use Wood," Kelly McCloskey & Associates, California. Franklin, J., Keliher, K., Morgan, P., Ritter, M., Taylor, S., (1999). "Portable Timber Bridge Systems for Forest Roads," 20, Edinburgh University, Edinburgh, Scotland. Nowak, A., Ritter, M., Stankiewicz, P., (1999). "Bending Tests of Bridge Deck Planks," Construction and Building Materials Elsevier Science. American Institute of Timber Construction, APA – The Engineered Wood Association, USDA Forest Service Wood in Transportation Program, (2005). "America’s Best Timber Bridges : Winners of the 2004-05 Timber Bridge Awards." Ministry of Natural Resources, (1990). "Standard Designs for Permanent Bridges," 75-89, Ministry of Natural Resources, Ontario, Canada. Glued Laminated Timber Association, (1991). "G.L.T.A Specifiers’ Guide to Glued Laminated Structural Timber," Glued Laminated Timber Association, United Kingdom. Harper, W., (1991). "Timber Shell Roofs on the River Thames London," Tysons Timber Engineering, London. Charles C. Schneider, (1905). "American Society of Civil Engineers Transactions," American Society of Civil Engineers. J.P. Snow, Robert Fletcher, (1932). "A History of the Development of Wooden Bridges," American Society of Civil Engineers. Timber Research and Development Association, (1983). "Edge Sealants for Wood-based Boards," Timber Research and Development Association. Timber Research and Development Association, (1991). "Conservation by Demonstration," Viewpoint Timber Research and Development Association. Gerhard Schickhofer, (1995). "Holzbrucken in der Steiermark," Austria. Ing. Harald Madritsch, (1997). "Wettbewerb Wohnbau Frojach," USDA, Forest Service, Forest Products Lab, Madison, WI. Market Development Alliance, (2000). "Product Selection Guide: FRP Composite Products for Bridge Applications," Market Development Alliance, Harrison, NY. Keith Crews, Stephen Bakoss, (1994). "Fundamental Research and Development of Cellular Stress Laminated Timber Bridge Decks for Short to Medium Span Bridges," Australia. United States Department of Agriculture, (2001). "Information on Modern Timber Bridges in the United States," USDA Forest Service. Bureau of Municipal Services, (2000). "Hybrid Timber Bridge Instructional Program: Deck Replacement Using Glulam Timber Panels on Steel I-Beams," Pennsylvania Department of Transportation, Harrisburg, PA.
Keith Crews, (1994). "Summary Report on the Research and Development Program on Stress Laminated Timber Bridges," University of Technology, Sydney, Australia. United States Department of Agriculture, (1990). "The Timber Bridge Initiative Status Report," USDA, Forest Service, Forest Products Lab, Madison, WI. United States Department of Agriculture, (1990). "The National Timber Bridge Initiative – 1990," USDA, Forest Service, Forest Products Lab, Madison, WI. Gerhard Werner, (1995). "Prestressing of Glulam-Beams," FMPA, Germany. Bertsche, (1997). "Bauen Mit Holz," Germany. Ernst Gehri, (1986). "Timber Bridges and Research in Switzerland," Nordic Timber Bridge Symposium Switzerland. Forde, M.C., (1999). "Construction and Building Materials," Volume 14, Number 4 Elsevier Science Ltd, Oxford, United Kingdom. United States Department of Agriculture, (2010). "USDA Forest Service, Forest Products Laboratory Research Demonstration House and Carriage House," USDA, Forest Service, Forest Products Lab, Madison, WI. Michael Caldwell, (1995). "Award Winning Timber Bridges – 1995," Washington, D.C..
American Forest and Paper Association, (1993). "Timber Bridges – 1992 Award Winners," American Forest and Paper Association, Washington, D.C..
Deza, T., Phares, B., Wacker, J., Wipf, T., (2010). "Development of a Smart Timber Bridge Girder with Fiber Optic Sensors," International Conference on Timber Bridges 2010 10-Jan, USDA, Forest Service, Forest Products Lab, Madison, WI. Ernst Gehri, (1989). "Brucken Und Stege Aus Holz," 274 Zurich. QSB, (1995). "Bruckenschlag aus Schweizer Holz," Renfer & Cie, Switzerland. Lungern Hans-Heini Gasser, (1992). "Neue Fussgangerbrucke uber die Engelbergeraa in Buochs," Schweizer Ingenieur und Architekt Lungern, Switzerland. Gehri, E., (1982). "Dorflibrucke Eggiwil," Switzerland. Campbell, I., H.R. Carlin-Smith, (1990). "Light Road Gluelam Bridge at Yarrawonga, Australia," 1990 International Timber Engineering Conference Australia. Australian Forest Industries Journal, (1990). "Timber a Functional, Aesthetic Success," Australian Forest Industries Journal and Logger Australia Post, Australia. McNaught, A., Tierney, J., (1990). "Strength Testing of Small Clear Samples from Timber Bridge Girders," Queensland Forest Service, Australia. Price, A., (1991). "Waterproofing of Concrete Bridge Decks: Site Practice and Failures," Transport and Road Research Laboratory, Australia. Roads and Traffic Authority of NSW, (1991). "Bridge over Yarramundi Lagoon at Agnes Banks," Roads and Traffic Authority of NSW, Sydney, Australia. Bayer, (1995). "Baytech Reactive Coatings," Penrith, Australia. Roads and Traffic Authority, (1989). "The Story of the Sydney Harbour Bridge," 35, Roads and Traffic Authority, Sydney, Australia. Price, A., (1990). "Laboratory Tests on Waterproofing Systems for Concrete Bridge Decks," Crown, United Kingdom. Bunnings, (1989). "Bunnings Bridge Manual," Bunnings Timber Engineering, Australia. Frank H. Schmidt, (1992). "Highway Engineering in Australia," Volume 24 Editorial and Publishing Consultants P/L, Australia. Bill Muir, (1995). "Laminated Bridge Part of Lake Program," Western Wood Products Association, Australia. Western Wood Products Association, (1992). "AUSTIM Update," 3 Western Wood Products Association, Australia. Roads and Traffic Authority, (1995). "Mittagong By-Pass," Roads and Traffic Authority, Australia. Australian Forest Industries Journal, (1991). "Victoria Gets Timber Bridge Deck Revolution," Australian Forest Industries Journal Australian Forest Industries, Australia. United States Department of Agriculture, (1995). "The National Timber Bridge Initiative – 1995," 10, USDA. United States Department of Agriculture, (1997). "The Wood In Transportation Program – 1997," 12, USDA. United States Department of Agriculture, (1996). "The Wood In Transportation Program – 1996," 12, USDA. United States Department of Agriculture, (1994). "The National Timber Bridge Initiative – 1994," 12, USDA. David S. Gromala, David V. Rosowsky, Donald A. Bender, (2006). "WCTE Conference Proceedings: 9th World Conference on Timber Engineering," World conference on Timber Engineering, Portland, OR. Koning, J., (2010). "USDA Forest Service Forest Products Library: Celebrating a Century of Accomplishments," USDA, Forest Service, Forest Products Lab, Madison, WI. Eugene Brancolini, (2004). "Spanning Time: America’s Covered Bridges," Indiana University, Bloomington, Indiana. Julian Marcroft, (1991). "Proceedings of the 1991 International Timber Engineering Conference," Volume 1, 140 London, United Kingdom. Monash University, (1987). "Timber Bridges : A National Seminar," 397, Centre for Continuing Education, Monash University, Victoria, Australia. Smith, M., Wacker, J., (2010). "Development of Standard Plans for Glulam Highway Bridges," National Center for Wood Transportation Structures. Gerhard Franz Roth, (1998). "Holzinnovationen aus Osterreich," 94, NORKA ZEITUNGSVERLAG, Klosterneuburg, Wiener Strasse. Ulrich Meierhofer, (1989). "Flurwegbrucke aus Holz: Dauerhaftigkeit als Konstruktionsgrundsatz," USDA, Forest Service, Forest Products Lab, Konrad Bosch AG, Zurich. Beineke, L., Criswell, M., DeBonis, A., Diekmann, E., Faherty, K., Freas, A., Gopu, V., Hoyle, Jr., R., Kaseguma, R., (1982). "Wood: Engineering Design Concepts," Clark C. Heritage Memorial Series on Wood, Volume IV, 1-605, Materials Education Council, Materials Research Laboratory, Penn. State Unv, Univeristy Park, PA.
Forest Products Lab, (1999). "Crossings, Issue 34," 34 USDA, Forest Service, Forest Products Lab, Madison, WI. McLean, D., Rammer, D., (1996). "Recent research on shear strength in wood beams," Proceedings of the international wood engineering conference, Vol. 2, 96-103, Civil/Environmental E. Louisiana State University, Baton Rouge, LA. Ritter, M., Wipf, T., (2010). "Literature Review and Assessment of Nanotechnology for Remote Sensing of Wood Transportation Structures," RIP 3333 014 07 USDA, Forest Service, Forest Products Lab, Madison, WI. Forest Products Lab, (1990). "Crossings, Issue 2," 2 USDA, Forest Service, Forest Products Lab, Madison, WI. National Association of Australian State Road Authority, (1976). "NAASRA Bridge Desgin Specification," Fifth Edition USDA, Forest Service, Forest Products Lab, Sydney, Australia. Australian-US Timber Program, Western Wood Products Association, (1991). "Guideline Design Procedures for Douglas Fir Longitudinal Stress-Laminated Timber Bridge Decks," 51, Western Wood Products Association, USDA, Pymble, Australia. Standards Association of Australia, (1988). "SAA Timber Structures Code," Australian Standard, 1720.1-1988, 88, Standards Association of Australia Standards House, Sydney, Australia. United States Department of Agriculture, (1993). "The National Timber Bridge Initiative – 1993," 14, USDA. United States Department of Agriculture, (1992). "The Timber Bridge Initiative – 1992," USDA. United States Department of Agriculture, (1991). "The Timber Bridge Initiative – 1991," USDA. United States Department of Agriculture, (1990). "The Timber Bridge Initiative – 1990," USDA. Cesa, E., Duwadi, S., Ritter, M., (2000). "Wood in Transportation Program – 2000," Transportation Research Record 310-315, National Academy Press, Washington, D.C.
United States Department of Agriculture, (1999). "National Wood In Transportation Program, 1999," 23, USDA. United States Department of Agriculture, (2001). "National Wood In Transportation Program, 2001," 26, USDA. Abdullah, N., De Groot, R., Herdman, D., Smith, W., (1996). "Preservative treatment of Red Maple," Forest Products Journal, 46(3), 35-41, Forest Products Society, Madison, WI. Dolan, J., Fogstad, C., Galloway, T., Puckett, J., (1996). "Initial tests of Kevlar prestressed timber beams," National conference on wood transportation structures, FPL-GTR-94, 215-224, USDA, Forest Service, Forest Products Lab, Madison, WI. Anthony, R., Pandey, A., (1996). "Determining the length of timber piles in transportation structures," National conference on wood transportation structures, FPL-GTR-94, 270-276, USDA, Forest Service, Forest Products Lab, Madison, WI. Forest Products Lab, (1993). "Crossings, Issue 12," 12 USDA, Forest Service, Forest Products Lab, Madison, WI. Cesa, E., Duwadi, S., Ritter, M., (2000). "Wood In Transportation Program – An Overview," Transportation Research Record, 1696, 310-315. Arnold, A., Buth, E., Campise, W., Hirsch, T., Ivey, D., Noel, J., (1984). "Safer Bridge Railings, Vol. I Summary Report," FHWA-RD-82-072, 1-154, Turner-Fairbank Highway Research Center, McLean, VA.
Lee, P., Wacker, J., (1996). "Standard plans for timber highway structures," National conference on wood transportation structures, FPL-GTR-94, 344-350, USDA, Forest Service, Forest Products Lab, Madison, WI. Forest Products Lab, (1995). "Crossings, Issue 20," 20 USDA, Forest Service, Forest Products Lab, Madison, WI. Ritter, M., Taylor, S., (1994). "Durability in stress laminated timber bridges," PTEC 94 Timber shaping the future: Proceedings of Pacific timber industry conference; 1994 July 11- 15; Gold Coast, Australia, Vol. 1, 686-694, Timber Research and Development Advisory Council, Queensland, Australia. Forest Products Lab, (2002). "Crossings, Issue 43," 43 USDA, Forest Service, Forest Products Lab, Madison, WI. Aggour, M., (1989). "Inspection of Bridge Timber Piling: Operations and Analaysis Manual," FHWA-IP-89-017, Jan-40, Turner-Fairbank Highway Research Center, McLean, VA.
Green, D., (1997). "New opportunities for mechanical grading of lumber," Wood Design Focus, Vol 8(2), 21-24, USDA, Forest Service, Forest Products Lab, Madison, WI. Russell, K., (1998). "Salt Storage Facility: Cedar County, Iowa," NA-TP-04-98, 5-Jan, USDA, Forest Service, WIT, Morgantown, WV. Forest Products Lab, (1993). "Crossings, Issue 14," 14 USDA, Forest Service, Forest Products Lab, Madison, WI. Kadnar, J., Kainz, J., Ritter, M., Yazdani, N., (1996). "Effect of preservative treatment on bar force in stress-laminated bridge decks," National conference on wood transportation structures, FPL-GTR-94, 245-251, USDA, Forest Service, Forest Products Lab, Madison, WI. Ritter, M., Williamson, T., (1991). "LRFD design for wood bridges," Structures Congress 1991: compact papers; 9th Structures Congress proceedings; 1991 April 29; Indianapolis, IN 482-485, ASCE - American Soceity of Civil Engineers, New York, NY. Smith, M., Wacker, J., (2001). "Standard Plans for Timber Bridge Superstructures," FPL-GTR-125, Jan-53, USDA, Forest Service, Forest Products Lab, Madison, WI. Duwadi, S., Ritter, M., Wijesooriya, C., Wipf, T., Wood, D., (1995). "Dynamic response of stress-laminated-deck bridges," Proceedings of 4th International bridge engineering conference; 1995 August 28-30; San Francisco, CA, Vol. 2, 381-394, National Academy Press, Washington, DC. Carpenter, J., (1997). "Structural dynamic performance of longitudial panel deck timber bridges," 1-133, Iowa State University, Ames, IA. Geske, E., Mason, L., McCutcheon, W., Moody, R., Ritter, M., Wacker, J., (1991). "Methods for assessing the field performance of stress-laminated timber bridges," Proceedings of the 1991 International timber engineering conference; 1991 September 2-5; London, United Kingdom, Vol. 3: 3.319-3.326 TRADA, London, United Kingdom. National Wood in Transportation Program, (1999). "Local Bridge No. 5-1, Allegany County, New York." Davalos, J., Petro, S., (1993). "Corrosion protection of steel hardware used in modern timber bridges," FHWA-RD-92-044, Jan-42, Turner-Fairbank Highway Research Center, McLean, VA.
Duwadi, S., Wood, D., (1996). "The Federal Highway Administration Timber Bridge Program," National conference on wood transportation structures, FPL-GTR-94, 333-339, USDA, Forest Service, Forest Products Lab, Madison, WI. Park, S., (1980). "Bridge Inspection and Structural Analysis (Handbook of Bridge Inspection)," 1-312 Trenton, NJ. National Wood in Transportation Program, (2001). "Hoblitt Lane/West Fork Bass Creek Bridge, Ravalli County, Montana." Johnson, D., (1979). "Load Test of Wood Bridge," 4-0997 St Regis Paper Company, St Louis Park, MN. Phares, B., Wacker, J., (2009). "Improved Ratings for Covered Bridges by Load Testing," USDA, Forest Service, Forest Products Lab, Madison, WI. Ritter, M., (1990). "AASHTO to publish stress-laminated deck design criteria," Wood Design Focus, 1(3):2 USDA, Forest Service, Forest Products Lab, Madison, WI. Morrell, J., Simonsen, J., Xiao, Y., (2002). "Effects of Water Flow Rate and Temperatureon Leaching From Creosote-Treated Wood," FPL-RN-0286, 6-Jan, USDA, Forest Service, Forest Products Lab, Madison, WI. Falk, R., Pellerin, R., Ross, R., Volny, N., (1994). "Evaluation of timber bridges using stress wave technology – Vol. 1," PTEC 94 Timber shaping the future: Proceedings of Pacific timber engineering conference; 1994 July 11-15; Gold Coast, Australia, Vol. 1, 458-464, Timber Research and Development Advisory Council, Queensland, Australia. Ritter, M., Weller, C., (1988). "Timber bridge wearing surfaces," Proceedings of the 1988 International Conference on Timber Engineering; 1988 September 19-22; Seattle, WA, Vol. 1, 765-776, USDA, Forest Service, Forest Products Lab, Madison, WI. Hatfield, C., Stanfill-McMillan, K., (1994). "Performance of steel, concrete, prestressed concrete and timber bridges," Developments in short and medium span bridge engineering '94: Proceedings of bridge management; 1994 August 8-11; Halifax, Nova Scotia 341-354, Canadian Society for Civil Engineering, Montreal, Canada. Forest Products Lab, (1992). "Crossings, Issue 8," 8 USDA, Forest Service, Forest Products Lab, Madison, WI. Forest Products Lab, (1991). "Crossings, Issue 4," 4 USDA, Forest Service, Forest Products Lab, Madison, WI. Buba, J., Clemena, G., Cook, J., Holt, F., Hughes, D., Hyman, W., Kamp, G., Knorr, R., Kogut, G., Koretzky, H., LeDoux, F., Levine, A., Linfante, A., Manning, D., Patel, N., Purvis, R., Roenker, D., Sprinkel, M., Wass, G., (1983). "Bridge Inspection and Rehabilitation," 899, Jan-76, Transportation Research Board, Washington, DC. Blankenhorn, P., Hernandez, R., Janowiak, J., Labosky Jr., P., Manbeck, H., Moody, R., (1995). "Efficient utilization of red maple lumber in glued-laminated timber beams," FLP-RP-41, 23-Jan, USDA, Forest Service, Forest Products Lab, Madison, WI. Eslyn, W., Moody, R., Muchmore, F., Tuomi, R., (1979). "Strength of log stringers after several year’s use in southeast Alaska," FPL-RP-346, Jan-46, USDA, Forest Service, Forest Products Lab, Madison, WI. Duwadi, S., Faller, R., Lee, P., Ritter, M., Rosson, B., (1995). "Plans for Crash-Tested Bridge Railings for Longitudinal Wood Decks," FPL-GTR-87, 27-Jan, USDA, Forest Service, Forest Products Lab, Madison, WI. Dimakis, A., Oliva, M., Ritter, M., (1988). "Stress laminated timber bridge decks: prototype project," Proceedings of the 1988 International Conference on Timber Engineering; 1988 September 19-22; Seattle, WA 645-649, USDA, Forest Service, Forest Products Lab, Madison, WI. Pellerin, R., Ross, R., (1994). "Nondestructive testing for assessing wood members in structures: A review," FPL-GTR-70, Jan-40, USDA, Forest Service, Forest Products Lab, Madison, WI. McDonald, K., Whipple, J., (1992). "Yield of 2 by 4 red oak stress-graded dimension lumber from factory-grade logs," Forest Products Journal, 42(6), 10-May. Hesselbarth, W., Vachowski, B., (1996). "Trail Construction and Maintenance Notebook," 9623-2833-MTDC, 1-139, USDA, Forest Service, Technology & Development Program, Missoula, MT. Hassler, C., Hawkins, J., Moody, R., Pahl, T., Slahor, J., (1992). "Efficient utilization of hardwoods for timber bridges," Jan-78, USDA, Forest Service, Forest Products Lab, Madison, WI. Aasheim, E., Falk, R., Solli, K., (1992). "The performance of glued laminated beams manufactured from machine stress graded norwegian spruce," Jan-60, USDA, Forest Service, Forest Products Lab, Madison, WI. Orr, B., Sowards, G., Stanfill-McMillan, K., Wang, J., (1996). "National cost study of timber bridges," National conference on wood transportation structures, FPL-GTR-94, 480-489, USDA, Forest Service, Forest Products Lab, Madison, WI. Moody, R., Ritter, M., (1990). "Structural wood products," Serviceability and durability of construction materials: Proceedings of 1st materials engineering congress; 1990 August 13-15; Denver, CO, Vol. 1, 41-52, ASCE - American Soceity of Civil Engineers, New York, NY. Dimakis, A., Oliva, M., Ritter, M., Tuomi, R., (1990). "Stress-laminated wood bridge decks: experimental and analytical evaluations," FPL-RP-495, 24-Jan, USDA, Forest Service, Forest Products Lab, Madison, WI. National Wood in Transportation Program, (1999). "Local Bridge No. 25-8, Allegany County, New York." Kainz, J., Stanfill-McMillan, K., (1995). "Factors Influencing Timber Bridge Performance," Structures Congress 1995: Restructuring: America and beyond: Proceedings of Structures Congress 13; 1995 April 2- 5; Boston, MA, Vol. 1, 294-297, ASCE - American Soceity of Civil Engineers, New York, NY. Meierhoefer, U., (1996). "Timber bridges in Central Europe, yesterday, today, tomorrow," National conference on wood transportation structures, FPl-GTR-94, 22-26, USDA, Forest Service, Forest Products Lab, Madison, WI. Cesa, E., Wacker, J., (2005). "Hardwoods for Timber Bridges: A National Program Emphasis by the US Forest Service," Wood Design Focus, Summer 2005 USDA, Forest Service, Forest Products Lab, Madison, WI. Cesa, E., Ritter, M., (1999). "National Wood In Transportation Program, 1999," 23-Jan, USDA, Forest Service, Morgantown, WV. Conger, D., Ritter, M., Wacker, J., (1996). "Field performance of timber bridges: 8. Lynches Woods Park stress-laminated deck bridge," FPL-RP-551, 17-Jan, USDA, Forest Service, Forest Products Lab, Madison, WI. National Wood in Transportation Program, (1999). "County Bridge #3, Greene County, Pennsylvania." Freitag, C., Love, C., Morrell, J., (1996). "Integrated remedial protection of wood in bridges," National conference on wood transportation structures, FPL-GTR-94, 445-454, USDA, Forest Service, Forest Products Lab, Madison, WI. National Wood in Transportation Program, (1999). "Bridge No. 1, Coshocton County, Ohio." Forest Products Lab, (1990). "Crossings, Issue 1," 1 USDA, Forest Service, Forest Products Lab, Madison, WI. Russell, K., (1997). "Portable Timber Bridges: An Eco-friendly Solution for Stream Crossings," NA-TP-01-97, 8-Jan, USDA, Forest Service, Morgantown, WV. Forest Products Lab, (1998). "Crossings, Issue 29," 29 USDA, Forest Service, Forest Products Lab, Madison, WI. Duwadi, S., Lee, P., Ritter, M., (1996). "National Conference on Wood Transportation Structures – 1996," FPL-GTR-94, 6-Jan, USDA, Forest Service, Forest Products Lab, Madison, WI. Forest Products Lab, (1996). "Crossings, Issue 22," 22 USDA, Forest Service, Forest Products Lab, Madison, WI. Forest Products Lab, (1997). "Crossings, Issue 25," 25 USDA, Forest Service, Forest Products Lab, Madison, WI. Davalos, J., Gardner, D., Munipalle, U., (1994). "Adhesive bonding of pultruded fiber-reinforced plastic to wood," Forest Products Journal, 44(5), 62-66. Hoyle, Jr., R., Rutherford, P., (1987). "Stress Wave Inspection of Bridge Timbers and Decking," WA-RD 146.1, 1-156, Dept. of Civil and Environmental Engineering, Washington State University, Pullman, Washington. Lewis, S., Ritter, M., Triche, M., Wolfe, R., (1994). "Design and field performance of a metal-plate-connected wood truss bridge," Structures Congress 1994: Structures Congress 12: Proceedings of papers presented at the structures congress '94; 1994 April 24-28; Atlanta, GA, Vol. 2, 1310-1315, ASCE - American Soceity of Civil Engineers, New York, NY. Moody, R., (1994). "Timber bridges – a rebirth," Woodland Manage, 15(4), 18-20. Kilborn, K., Russell, K., (1997). "Working for Rural America: Wood Double-Diffusion Treatment Plant," WIT-05-97, 6-Jan, USDA, Forest Service, WIT, Morgantown, WV. Faller, R., Fowler, M., Keller, E., Polivka, K., Ritter, M., Rosson, B., (2002). "Two Test Level 4 Bridge Railing and Transition Systems for Transverse Timber Deck Bridges," FP-95-RJVA-2630, 1-493, USDA, Forest Service, Forest Products Lab, Madison, WI. Erickson, R., Seavey, R., Wacker, J., (1996). "Cold temperature effects on stress-laminated timber bridges," National conference on wood transportation structures, FPL-GTR-94, 232-238, USDA, Forest Service, Forest Products Lab, Madison, WI. Bernecker, C., Boothby, T., Burroughs, C., Cegelka, S., Grgurevich, S., Lee, D., Lee, P., Manbeck, H., Ritter, M., (2001). "Design of wood highway sound barriers," FPL-RP-596, Jan-69, USDA, Forest Service, Forest Products Lab, Madison, WI. Tuomi, R., (1980). "The Truss-Framed System For Residential And Light Commercial Buildings," Southern Lumberman, 12/15/80 USDA, Forest Service, Forest Products Lab, Madison, WI. Duwadi, S., Faller, R., Hilbrich Lee, P., Ritter, M., Rosson, B., (1998). "Plans for crash-tested wood bridge railings for concrete decks," FPL-GTR-108, 18-Jan, USDA, Forest Service, Forest Products Lab, Madison, WI. Kainz, J., Ritter, M., (1998). "Effect of cold temperatures on stress-laminated timber decks," World Conference on Timber Engineering 1998: 5th World Conference, Vol. 2, 42-49, Swiss Federal Institute of Technology, Lausanne, Switzerland. Bronstad, M., Michie, J., (1976). "Upgrading Safety Performance in Retrofitting Traffic Railing Systems," FHWA-RD-77-40 FHWA - Federal Highway Administration, Offices of Research & Development, Washington, DC. Forest Products Lab, (1991). "Crossings, Issue 6," 6 USDA, Forest Service, Forest Products Lab, Madison, WI. Duwadi, S., Faller, R., Keller, R., Ritter, M., Rosson, B., (2001). "Development of Two Test Level 2 Bridge Railings and Transitions for Use on Transverse Glue-Laminated Deck Bridges," Transportation Research Record 1743, Paper No. 01-0378 Transportation Research Board, National Research Council, Washington, DC. Forest Products Lab, (1991). "Crossings, Issue 5," 5 USDA, Forest Service, Forest Products Lab, Madison, WI. Moody, R., Ritter, M., (1997). "Wood in Infrastructure: Analysis of research needs and goals," Wood Engineering in the 21st Century: Research Needs and Goals 96-108, ASCE - American Soceity of Civil Engineers, Portland, OR. Cooper, P., Lebow, P., Lebow, S., (2004). "Variability in Evaluating Environmental Impacts of Treated Wood," FLP-RP-620 USDA, Forest Service, Forest Products Lab, Madison, WI. Franklin, J., Morgan, P., Ritter, M., Taylor, S., (2001). "Portable T-Section GlulamTimber Bridge Modules:Modeling and Performance," Jan-40, USDA, Forest Service, Forest Products Lab, Madison, WI. Otter, D., Ritter, M., Rogers, P., Wipf, T., Wood, D., (1997). "Effectiveness of glued laminated components in strengthening timber bridges," Technology Digest, TD 97(026) AARR Technology Department. Brokaw, J., Davalos, J., Dickson, B., Wolcott, M., (1992). "Quality Assurance and Inspection Manual for Timber Bridges," SS-046, 216, Constructed Facilities Center, West Virginia University, Morgantown, WV. Phares, B., Wacker, J., (2007). "Development of a Smart Timber Bridge Phase II: Integration of Sensors into Glued-Laminated Beams," USDA, Forest Service, Forest Products Lab, Madison, WI. Taylor, R., (1987). "Load Testing and Rehabilitation of the Sioux Narrows Bridge," SRR-86-04, 1-180, Ontario Ministry of Transportation, Downsview, Ontario. Forest Products Lab, (1994). "Crossings, Issue 16," 16 USDA, Forest Service, Forest Products Lab, Madison, WI. Burroughs, C., Chalfant, G., Townsend, M., (1976). "Slope Stability in Road Construction: A Guide to the Construction of Stable Roads in Western Oregon and Northern California," 1-102, Bureau of Land Management, Oregon State Office, Portland, OR. Brashaw, B., Ross, R., Vatalaro, R., Wacker, J., Wang, X., (2005). "Nondestructive Assessment of Timber Bridges Using a Vibration Method," Structures Congress 2005: Proceedings of the 2005 Structures Congress, April 20-24 ASCE - American Soceity of Civil Engineers, New York, NY. Ritter, M., Wacker, J., (1995). "Field performance of timber bridges: 3. Birchlog Run and Tumbling Rock Run stress-laminated deck bridges," FPL-RP-538, 11-Jan, USDA, Forest Service, Forest Products Lab, Madison, WI. Zelinka, S., (2009). "Corrosion of Fasteners in Wood Treated with Newer Wood Preservatives for Potential Rehabilitation of Covered Bridges," USDA, Forest Service, Forest Products Lab, Madison, WI. Bradley, A., Krag, R., (1990). "Span Designs for Constructing Temporary Log-Stringer Bridges in Ontario," SR-64, 19-Jan, Forest Engineering Research Institute of Canada, Vancouver, B.C..
Kwasniewski, L., Maliszkiewicz, P., Nowak, A., Ritter, M., (1999). "Drewniane Mosty Sprezone," Inzynieria I Budownictwo, 9'99, 495-498 Warsaw, Poland. Hasebe, K., Horie, Y., Usuki, S., (1990). "Timber Tied Arch Bridge on City Roadway," International Timber Engineering Conference 1990 431-438, International Timber Engineering Conference, Tokyo, Japan. Hilbrich Lee, P., Ritter, M., (1997). "Timber bridges in Southern Iowa," Structures Congress 1997: Proceedings of Structures Congress XV, Vol. 1, 295-299, ASCE - American Soceity of Civil Engineers, New York, NY. Alampalli, S., Duwadi, S., Herman, R., Kleinhans, D., Mahmoud, K., Ray, M., Wacker, J., (2008). "Enhancing Bridge Performance," The American Society of Civil Engineers Structural Engineering Institute Bridge Workshop 1-126, The American Society of Civil Engineers, Reston, VA.
Ritter, M., Triche, M., (1996). "Pole creek metal-plate-connected truss bridge," National conference on wood transportation structures, FPL-GTR-94, 49-57, USDA, Forest Service, Forest Products Lab, Madison, WI. Forest Products Lab, (1997). "Crossings, Issue 26," 26 USDA, Forest Service, Forest Products Lab, Madison, WI. Fanous, F., Rammer, D., (2009). "Improved Analytical Techniques for Historic Covered Bridges," USDA, Forest Service, Forest Products Lab, Madison, WI. Feist, W., Williams, R., (1999). "Selection and Application of Exterior Stains for Wood," FPL-GTR-106, 9-Jan, USDA, Forest Service, Forest Products Lab, Madison, WI. Crews, K., Ritter, M., (1996). "Development of limit states design procedures for timber bridges," National conference on wood transportation structures, FPL-GTR-94, 292-300, USDA, Forest Service, Forest Products Lab, Madison, WI. Forest Service Engineering Staff, (1985). "Forest Service Specifications for Construction of Bridges & Other Major Drainage Structures," EM-7720-100B, 1-241, USDA, Forest Service, Engineering Staff, Washington, DC. Ritter, M., Taylor, S., (2000). "DEVELOPMENT AND TESTING OF PORTABLE GLULAM TIMBER BRIDGE SYSTEMS," Transportation Research Board79th Annual Meeting, Paper No. 00-0334, 15-Jan, USDA, Forest Service, Forest Products Lab, Madison, WI. Franklin, J., (1999). "Design Provisions for Portable Longitudinal Glued-Laminated Timber Deck Bridges for use in Forest Operations," 1-237, Aubrun University, Auburn, Alabama. Avent, R., Bakht, B., Barnhart, J., Dimakis, A., Ehlert, R., Jackson, A., Jaeger, L., Klaiber, W., McCutcheon, W., Moody, R., Muchmore, F., Nowak, A., Oliva, M., Ou, F., Parry, J., Sanders, Jr., W., Supernant, B., Taylor, S., Tuomi, R., Videon, F., Weller, C., Wipf, T., (1986). "Timber Bridges," 1053, Jan-79, Transportation Research Board, National Research Council, Washington, DC. Davis, A., Ellingwood, B., Frank, K., Hennecke II, E., Henriquez, O., Jones, N., Pellerin, R., Plecknik, J., Ross, R., Teller, A., (1993). "Proceedings: Conference on Nondestructive Evaluation of Bridges," Conference on Nondestructive Evaluation of Bridges August 25-27, 1992, FHWA-RD-93-040A Turner-Fairbank Highway Research Center, McLean, VA.
Phares, B., Wipf, T., (2005). "Development of Design Recommendations to Minimize Timber Deck Panel Differential Deflection," USDA, Forest Service, Forest Products Lab, Madison, WI. Phares, B., Wipf, T., (2005). "Needs Assessment for Advancing Timber Utilization in Mainline and Short-Line Railroad Applications," USDA, Forest Service, Forest Products Lab, Madison, WI. Ritter, M., Wipf, T., (2007). "Revision of Timber Bridge Design Specifications," USDA, Forest Service, Forest Products Lab, Madison, WI. Phares, B., Wipf, T., (2005). "Remote Monitoring of Historic Covered Timber Bridges in Madison County for Prevention of Arson and Vandalism," USDA, Forest Service, Forest Products Lab, Madison, WI. Elleby, H., Klaiber, W., Sanders, Jr., W., Timm, L., (1975). "Ultimate Load Behavior of Full-Scale Highway Truss Bridges: Phase IUltimate Load Tests of the Hubby Bridge: Boone County," HR-169, 1-104, Iowa State Highway Commission, Ames, IA. Calil, Jr., C., Hilbrich Lee, P., Hislop, L., Kainz, J., Wacker, J., (2004). "Long-Term Performance Monitoring of Hardwood Timber Bridges in Pennsylvania," FPL-RP-612, Jan-56, USDA, Forest Service, Forest Products Lab, Madison, WI. GangaRao, H., Moody, R., Ritter, M., (1990). "Applications of wood materials for innovative bridge systems," Serviceability and durability of construction materials: Proceedings of 1st materials engineering congress; 1990 August 13-15; Denver, CO, Vol. 1, 423-432, ASCE - American Soceity of Civil Engineers, New York, NY. Forest Products Lab, (1999). "Crossings, Issue 35," 35 USDA, Forest Service, Forest Products Lab, Madison, WI. Hernandez, R., Moody, R., Somnath, S., (1992). "Evaluation of yellow poplar glued laminated timber beams," 92-4556, 12-Jan, American Society of Agricultural Engineers, St. Joseph, MI. Moody, R., Muchmore, F., Tuomi, R., Wolfe, R., (1979). "Bending strength of large Alaskan Sitka spruce and western Hemlock log bridges," FPL-RP-341, 16-Jan, USDA, Forest Service, Forest Products Lab, Madison, WI. Keenan, F., Taylor, S., (1992). "Wood Highway Bridges," Wood Text Series, 2, 1-193, Canadian Wood Council, Ottawa, Ontario. Blankenhorn, P., Bukowski, P., Kainz, J., Ritter, M., (1999). "Moisture protection for timber members," Forest Research Bulletin: Proceedings of the Pacific Timber Engineering Conference, No. 212. Vol. 2: 240-248 New Zealand Forest Research Institute, Rotorua, New Zealand. Cassens, D., De Groot, R., Feist, W., Johnson, B., (1995). "Selection and use of preservative-treated wood," Forest Products Society, Madison, WI. Janowiak, J., Manbeck, H., Thomforde, D., Witmer, R., (1996). "Timber bridge hardwood glulam deck connector evaluations under static and repetitive loads," National conference on wood transportation structures, FPL-GTR-94, 122-130, USDA, Forest Service, Forest Products Lab, Madison, WI. National Wood in Transportation Program, (1999). "Baileyville Bridge, Centre County, Pennsylvania." Forest Products Lab, (1996). "Crossings, Issue 21," 21 USDA, Forest Service, Forest Products Lab, Madison, WI. Forest Products Lab, (1993). "Crossings, Issue 13," 13 USDA, Forest Service, Forest Products Lab, Madison, WI. Wacker, J., (2003). "Cold Temperature Effects on Stress-Laminated Timber Bridges: A Laboratory Study," FPL-RP-605, 22-Jan, USDA, Forest Service, Forest Products Lab, Madison, WI. Brungraber, R., Lichtenstein, A., Pierce, P., Sabol, S., (2005). "Covered Bridge Manual," FHWA-HRT-04-098 Turner-Fairbank Highway Research Center, McLean, VA.
Cesa, E., Knotts, J., Lempicki, E., (2003). "Recycling Municipal Trees: A Guide for Marketing Sawlogs from Street Tree Removals in Municipalities," NA-TP-02-94, Jan-60, USDA, Forest Service, Northeastern Area State & Private Forestry, Res. Mgmt, Morgantown, WV. Mills, J., (1986). "The Timber People: A History of Bunnings Limited," 1-296, Bunnings Limited, Perth, Western Australia. National Wood in Transportation Program, (1999). "Nelson Slough Bridge, Skagway, Alaska." Hernandez, R., Lee, P., Moody, R., Ritter, M., (1996). "Yellow poplar glued-laminated timber: Product development and use in timber bridge construction," National conference on wood transportation structures, FPL-GTR-94, 411-417, USDA, Forest Service, Forest Products Lab, Madison, WI. Eamon, C., Murphy, J., Nowak, A., Ritter, M., (2000). "Reliability-based criteria for load and resistance factor design code for wood bridges," Transportation Research Record 1696, Paper No. 5B0016 Vol. 1, 316-322, Transportation Research Board, National Research Council, Washington, DC. Amburgey, T., Barnes, H., Forney, R., Pentz, S., Sanders, M., (2005). "National Historic Covered Bridge Preservation Research: Fire Retardant Treatments for Historic Covered Bridges," DTFH61-00-C00117, 1-128, Keast & Hood Co., Philadelphia, PA.
Davalos, J., Hernandez, R., Moody, R., Shaik, S., Sonti, S., (1996). "System stiffness for stress-laminated timber bridge decks," Proceedings of the international wood engineering conference, Vol. 1, 213-220, Civil/Environmental E. Louisiana State University, Baton Rouge, LA. Rummer, R., Taylor, S., Thompson, J., Welch, R., Yoo, K., (1999). "What We Know – and Don’t Know – about Water Quality at Stream Crossings," Journal of Forestry, Vol. 97, Num. 8, 17-Dec, Society of American Foresters, Bethesda, MD. Forest Products Lab, (1993). "Crossings, Issue 11," 11 USDA, Forest Service, Forest Products Lab, Madison, WI. Gilham, P., Kent, S., Tingley, D., (1996). "Long term load performance of FRP reinforced glulam bridge girders," National conference on wood transportation structures, FPL-GTR-94, 201-206, USDA, Forest Service, Forest Products Lab, Madison, WI. Korites, B., (1982). "Structural Analaysis Software for Micros," Kern Publications, Duxbury, Massachusetts. Bishop, S., Kainz, J., Ritter, M., Wacker, J., (2001). "Field performance of timber bridges: 21. Humphrey stress-laminated T-beam bridge," FPL-RP-597, 16-Jan, USDA, Forest Service, Forest Products Lab, Madison, WI. Altimore, F., Caccese, V., Dagher, H., Hsu, Y., Ritter, M., Wolfe, R., (1995). "Using lightweight MPC wood trusses in bridges," Structures Congress 1995: Restructuring: America and beyond: Proceedings of Structures Congress 13; 1995 April 2- 5; Boston, MA, Vol. 1, 12-Sep, ASCE - American Soceity of Civil Engineers, New York, NY. Goble, G., Hannigan, P., Likins, G., Rausche, F., Thendean, G., (1996). "Design and Construction of Pile Driven Foundations: Workshop Manual Volume I," FHWA-HI-97-013, 1-822, FHWA - Federal Highway Administration, Washington, DC. Forest Products Lab, (2003). "Crossings, Issue 44," 44 USDA, Forest Service, Forest Products Lab, Madison, WI. King, J., (1993). "Spans of Time: Oklahoma Historic Highway Bridges," 1-133, Oklahoma Department of Transportation, Oklahoma City, Oklahoma. Duwadi, S., Ritter, M., (1995). "Research on timber bridges and related topics: Research update," FHWA - Federal Highway Administration, Washington, DC. Duwadi, S., Ritter, M., Wacker, J., (1995). "Field performance of stress-laminated timber bridges on low-volume roads," Proceedings of the 6th International conference on low-volume roads; 1995 June 25-29; Minneapolis, MN, Vol. 2, 347-356, National Academy Press, New York, NY. Bachus, R., Carlson, D., Elias, V., Giroud, J., (1998). "Stress Cracking Potential of HDPE Geogrids," FHWA-RD-97-142, 1-184, Turner-Fairbank Highway Research Center, McLean, VA.
Selbo, M., (1975). "Adhesive Bonding of Wood," Tech. Bulletin #1512, 1-122, USDA, Forest Service, Washington, DC. Faller, R., Halloway, J., Pfeifer, B., Rosson, B., (1992). "Performance Level 1 Tests on the Nebraska Open Concrete Bridge Rail," TRP-03-28-91 Midwest Roadside Safety Facility, Civil Engineerign Dept., Lincoln, NE. Dubas, P., Gehri, E., (1983). "Beitrag der Baumeister Grubenmann zur Entwicklung des Holzbruckenbaus/Entwicklung des ingenieurmassigen Holzbaus seit Grubenmann," 21-Jan, Baustatik und Stahlbau, Zurich, Switzerland. Petersen, J., (2003). "Evergreen," Nov. 2003, 15-Jan, The Evergreen Foundation, Bigfork, MT. Lebow, S., (2009). "Guide for In-Place Preservative Treatment of Covered Bridges," USDA, Forest Service, Forest Products Lab, Madison, WI. Dickson, B., (1995). "Modern Timber Bridges of West Virginia, Volume I," Jan-53, USDA Forest Service, Morgantown, WV. Ray, M., (1992). "Summary Report on Selected Bridge Railings," FHWA-SA-91-049, 29-Jan, FHWA - Federal Highway Administration, Washington, DC. Keliher, K., Murphy, G., Ritter, M., Taylor, S., Thompson, J., (1995). "Portable glulam timber bridge design for low- volume forest roads," Proceedings of the 6th International conference on low-volume roads; 1995 June 25-29; Minneapolis, MN, Vol. 2, 328-338, National Academy Press, New York, NY. Duwadi, S., Faller, R., Fowler, M., Ritter, M., Rosson, B., (2000). "Two Test Level 4 Bridge Railing and Transition System for Transverse timber Deck Bridges," Transportation Research Record 1696, Paper No. 5B0110 Vol. 1, 334-351, Transportation Research Board, National Research Council, Washington, DC. Carnell, J., Castjohn, F., Dishongh, B., Smith, J., (1996). "Proof loading closed timber bridges," National conference on wood transportation structures, FPL-GTR-94, 455-458, USDA, Forest Service, Forest Products Lab, Madison, WI. Davalos, J., Hernandez, R., Moody, R., Sonti, S., (1993). "Yellow Poplar glulam timber beam performance," FPL-RP-520, 28-Jan, USDA, Forest Service, Forest Products Lab, Madison, WI. Ritter, M., Tice, E., Wacker, J., (1995). "Design, construction, and evaluation of timber bridge constructed of cottonwood lumber," Proceedings of 4th International bridge engineering conference; 1995 August 28-30; San Francisco, CA, Vol. 2, 358-370, National Academy Press, New York, NY. Mrkich, D., Oltman, J., (1984). "Hand Drilling and Breaking Rock," 1993-0-790-259/60009, 27-Jan, USDA, Forest Service, Technology & Development Program, Missoula, MT. Dalemo, M., (1991). "Trabroar – med stod av spannbock eller dragband," Examensarbete 73, Jan-69, Svergies Lantbruksuniversitet, Uppsala, Sweden. National Wood in Transportation Program, (1999). "Dutch Hill Road Timber Bridge, Crawford County, Pennsylvania." Forest Products Lab, (2002). "Crossings, Issue 41," 41 USDA, Forest Service, Forest Products Lab, Madison, WI. Crawford, D., De Groot, R., Woodward, C., (1996). "Integrated efficacy evaluation of new preservatives in alternative wood species," National conference on wood transportation structures, FPL-GTR-94, 379-388, USDA, Forest Service, Forest Products Lab, Madison, WI. Anderson, S., Huhnke, R., Zwerneman, F., (1995). "Glued-laminated timber panels for bridge deck replacement," National conference on wood transportation structures, FPL-GTR-94, 437-444, USDA, Forest Service, Forest Products Lab, Madison, WI. Apple, D., Woodward, C., (1996). "Stress-laminated / steel T-beam bridge system," National conference on wood transportation structures, FPL-GTR-94, 65-71, USDA, Forest Service, Forest Products Lab, Madison, WI. Franklin, R., Morgan, P., Ritter, M., Taylor, S., (1999). "Design Criteria for Portable Timber Bridge systems: Static versus Dynamic Loads," Presented at the 1999 Annual International Meeting sponsored by ASAE and CSAE-SCGR, Paper No. 99-4208 ASAE, Joseph, MI. Dlabola, J., (1995). "Dynamic behavior of glued laminated timber stringer bridges," 1-165, Iowa State University, Ames, IA. Brungraber, R., (1983). "Timber Design for the Civil Professional Engineering Examination," Engineering Review Manual Series, 0-932276-38-5, 1-202, Professional Engineering Registration Program, San Carlos, CA. Kretschmann, D., Wiedenhoeft, A., (2009). "Species Identification and Field-Grading of Woods in Covered Bridges," USDA, Forest Service, Forest Products Lab, Madison, WI. Alderman, M., Spelter, H., (2005). "Profile 2005: Softwood Sawmills in the United States and Canada," FPL-RP-630 USDA, Forest Service, Forest Products Lab, Madison, WI. Sprinkel, M., (1985). "Prefabricated Bridge Elements and Systems," 119, Jan-75, National Cooperative Highway Research Program, TRB, Washington, DC. Duwadi, S., Moody, R., Ritter, M., Wipf, T., (1993). "Development of six-year research needs assessment for timber transportation structures," FPL-GTR-74, Jan-44, USDA, Forest Service, Forest Products Lab, Madison, WI. National Wood in Transportation Program, (1999). "Graves Crossing Bridge, Antrim County, Michigan." Blankenhorn, P., Janowiak, J., Labosky Jr., P., Manbeck, H., (1996). "Standard designs for hardwood glued-laminated highway bridges," National conference on wood transportation structures, FPL-GTR-94, 351-360, USDA, Forest Service, Forest Products Lab, Madison, WI. Bunnell, S., Faller, R., Lee, P., Ritter, M., Rosson, B., (1998). "Plans for crash-tested bridge railings for longitudinal wood decks on low-volume roads," FPL-GTR-107, 12-Jan, USDA, Forest Service, Forest Products Lab, Madison, WI. Driscoll, D., (1979). "Retaining Wall Design Guide," 006702N USDA, Forest Service, Region 6, Portland, OR. Bertsche, (1990). "Bauen mit Holz," 9/89, 11/89, 5/90 Bauen mit Holz, Bruderverlag, Karlsruhe, Deutschland. McCutcheon, W., (1992). "The Mormon Creek bridge: performance after three years," FPL-RP-509, 8-Jan, USDA, Forest Service, Forest Products Lab, Madison, WI. Emerson, R., Fridley, K., Kainz, J., McLean, D., Pollock, D., Ross, R., (1998). "Nondestructive evaluation techniques for timber bridges," World Conference on Timber Engineering 1998: 5th World Conference, Vol. 1, 670-677, Swiss Federal Institute of Technology, Lausanne, Switzerland. Kukachka, B., (1970). "Properties of Imported Tropic Woods," FPL 125, Jan-67, USDA, Forest Service, Forest Products Lab, Madison, WI. Groenier, J., (1996). "Load rating of single span, glulam beam bridges using two computer applications," National conference on wood transportation structures, FPL-GTR-94, 459-466, USDA, Forest Service, Forest Products Lab, Madison, WI. National Wood in Transportation Program, (1999). "Lynn Run Trail Bridge #2, Westmoreland County, Pennsylvania." Cesa, E., Duwadi, S., Ritter, M., (1998). "An Overview of the wood in transportation program in the United States," World Conference on Timber Engineering 1998: 5th World Conference Swiss Federal Institute of Technology, Lausanne, Switzerland. Bronstad, M., Michie, J., (1981). "Multiple-Service-Level Highway Bridge Railing Selection Procedures," 239, 1-155, Transportation Research Board, National Research Council, Washington, DC. Krisciunas, R., (1996). "Ontario’s experience with composite wood/steel bridges," National conference on wood transportation structures, FPL-GTR-94, 313-320, USDA, Forest Service, Forest Products Lab, Madison, WI. Blinn, C., Dahlman, R., Hislop, L., Thompson, E., (1998). "Temporary stream and wetland crossing options for forest management," NC-GTR-202, 1-125, USDA, Forest Service, N. Central Research Station, St. Paul, MN. Forest Products Lab, (1994). "Crossings, Issue 15," 15 USDA, Forest Service, Forest Products Lab, Madison, WI. Lee, P., Ritter, M., (1996). "Recommended constructed practices for stress-laminated wood bridge decks," Proceedings of the international wood engineering conference, Vol. 1, 237-244, Civil/Environmental E. Louisiana State University, Baton Rouge, LA. Aasheim, E., Kleppe, O., (1996). "Timber Bridges in Nordic Countries," National conference on wood transportation structures, FPL-GTR-94, 16-Oct, USDA, Forest Service, Forest Products Lab, Madison, WI. Rammer, D., Soltis, L., (1996). "Experimental shear strength of glued-laminated beams," FPL-RP-527, Jan-38, USDA, Forest Service, Forest Products Lab, Madison, WI. National Wood in Transportation Program, (1999). "County Bridge 134, Perry County, Indiana." National Wood in Transportation Program, (1999). "Main Black Bridge, Montmorency County, MI." Ericksson, M., Kattell, J., (1998). "Bridge Scour Evaluation:Screening, Analysis, & Countermeasures," 9877 1207 - SDTDC USDA, Forest Service, Technology & Development Program, San Dimas, CA. Webb, D., (1998). "The Tie Guide: Handbook for Commercial Timbers Used by the Crosstie Industry," Jan-76, The Railway Tie Association, Fayetteville, GA.
Kainz, J., Ritter, M., Wacker, J., (1998). "Field performance of timber bridges: 17. Ciphers stress-laminated deck bridge," FPL-RP-572, 16-Jan, USDA, Forest Service, Forest Products Lab, Madison, WI. Dickson, B., GangaRao, H., (1989). "Field monitoring of a stressed timber bridge over Elk Two-Mile Creek, West Virginia," The conference on bridges: Proceedings of the 6th annual international bridge conference; 1989 June 12-14; Pittsburgh, PA 247-252, Engineers' Society of Western Pennsylvania. McCutcheon, W., Tuomi, R., (1973). "Procedure for design of glued-laminated orthotropic bridge decks," FPL-RP-210, Jan-42, USDA, Forest Service, Forest Products Lab, Madison, WI. Ritter, M., Wipf, T., Wood, D., (1999). "Dynamic evaluation and testing of timber highway bridges," Forest Research Bulletin: Proceedings of the Pacific Timber Engineering Conference, No. 212 Vol. 3, 333-340, USDA, Forest Service, Forest Products Lab, Madison, WI. Caccese, V., Dagher, H., Ritter, M., West, B., Wolfe, R., (1996). "Fatigue design criteria of MPC wood trusses for bridge applications," National conference on wood transportation structures, FPL-GTR-94, 58-64, USDA, Forest Service, Forest Products Lab, Madison, WI. Walter, G., (1996). "Timber bridges in Australia," National conference on wood transportation structures, FPL-GTR-94, 17-21, USDA, Forest Service, Forest Products Lab, Madison, WI. Bigelow, J., Phares, B., Ritter, M., Wipf, T., Wood, D., (2004). "Dynamic Field Performance of Timber Bridges," USDA, Forest Service, Forest Products Lab, Madison, WI. Bronstad, M., Bruno, N., Bryden, J., Fortuniewicz, J., Hancock, K., Humble, W., Hunter, W., Mayer, Jr., J., McDevitt, C., Meczkowski, L., Michie, J., Ray, M., Ross, R., Sicking, D., Stutts, J., (1987). "Roadside Safety Features," 1133, Jan-57, Transportation Research Board, National Research Council, Washington, DC. Forest Products Lab, (1997). "Crossings, Issue 27," 27 USDA, Forest Service, Forest Products Lab, Madison, WI. Bakoss, S., Crews, K., (1996). "Fundamental structural behavior of “built-up” stress laminated timber bridge decks," National conference on wood transportation structures, FPL-GTR-94, 39-48, USDA, Forest Service, Forest Products Lab, Madison, WI. Collins, W., (1996). "Rehabilitating historic timber transportation structures at Burnt Cabins Grist Mill, Burn Cabins," National conference on wood transportation structures 72-81, USDA, Forest Service, Forest Products Lab, Madison, WI. National Wood in Transportation Program, (2000). "McCurdy Road Timber Bridge, Richland County, Ohio." LaViolette, M., Phares, B., Ritter, M., Wipf, T., (2010). "Remote Monitoring of Historic Covered Timber Bridges for the Prevention of Arson and Vandalism," GTR-191, 29-Jan, USDA, Forest Service, Forest Products Lab, Madison, WI. Forest Products Lab, (1999). "Crossings, Issue 33," 33 USDA, Forest Service, Forest Products Lab, Madison, WI. Eamon, C., Nowak, A., Ritter, M., (1999). "Structural Reliability of Plank Decks," Structures Congress 1999: Proceedings of the 1999 Structures Congress, Structural Engineering in the 21st Century 688-691, Structural Engineering Institute and ASCE, New Orleans, LA. National Wood in Transportation Program, (1999). "Kepler-Bradley Lakes Bridge, Matanuska-Susitna Borough, Alaska." Forest Products Lab, (1996). "Crossings, Issue 24," 24 USDA, Forest Service, Forest Products Lab, Madison, WI. Phares, B., Ritter, M., (2007). "Design of a Timber Bridge to Evaluate Deck Design Details," USDA, Forest Service, Forest Products Lab, Madison, WI. Hislop, L., Ritter, M., (1996). "Field performance of timber bridges: 7. Connell Lake stress-laminated deck bridge," FPL-RP-550, 13-Jan, USDA, Forest Service, Forest Products Lab, Madison, WI. Taylor, R., (1984). "Prestressed Wood Applications," WASHTO 1984, Rapid City, SD Ministry of Transportation and Communications, Downsview, Ontario. Abdel-Magid, B., Dagher, H., Iyer, S., Ritter, M., (1997). "GRP Prestressing of Wood Decks," Structures Congress 1997: Building to last: Proceedings of Structures Congress XV, Vol. 1, 585-589, ASCE - American Soceity of Civil Engineers, New York, NY. Ritter, M., Wipf, T., Wood, D., (1998). "Evaluation and testing of timber railroad bridges," World Conference on Timber Engineering 1998: 5th World Conference, Vol. 1, 792-793, Swiss Federal Institute of Technology, Lausanne, Switzerland. Forest Products Lab, (1996). "Crossings, Issue 23," 23 USDA, Forest Service, Forest Products Lab, Madison, WI. Faller, R., (1998). "Response of rectangular elastoplastic beams to monotonic and alternating yield conditions," 1-244, University of Nebraska - Lincoln, Lincoln, NE. Duwadi, S., Ritter, M., Wacker, J., (2000). "Field Performance of Stress-Lam Bridges," Transportation Research Record 1740 96-103, Transportation Research Board, National Research Council, Washington, DC. Duwadi, S., Ritter, M., Wipf, T., (1995). "Dynamic Evaluation of Wood Bridges," Structures Congress 1995: Restructuring: America and beyond: Proceedings of Structures Congress 13; 1995 April 2- 5; Boston, MA, Vol. 1, 4-Jan, ASCE - American Soceity of Civil Engineers, New York, NY. Batchelor, B., Taylor, R., Van Dalen, K., (1983). "Prestressed Wood Bridges," SRR-83-01, 15-Jan, Ministry of Transportation and Communications, Downsview, Ontario. Forest Service Engineering Staff, (1985). "Forest Service Specifications for Construction of Roads & Minor Drainage Structures," EM-7720-100R, 1-156, USDA, Forest Service, Engineering Staff, Washington, DC. Calil, Jr., C., (1996). "Timber bridges in South America," National conference on wood transportation structures, FPL-GTR-94, 27-38, USDA, Forest Service, Forest Products Lab, Madison, WI. Wacker, J., (2004). "Recent Trends in Preservative Treatments for Timber Bridges," Wood Design Focus, 14:02, 17-20, Forest Products Society, Madison, WI. Forest Products Lab, (2001). "Crossings, Issue 40," 40 USDA, Forest Service, Forest Products Lab, Madison, WI. Brooks, K., (2004). "Polycyclic Aromatic Hydrocarbon Migration from Creosote-Treated Railway Ties into Ballast and Adjacent Wetlands," FPL-RP-617 USDA, Forest Service, Forest Products Lab, Madison, WI. Forest Products Lab, (1974). "Wood Handbook: Wood as an Engineering Material – 1974," 72 USDA, Forest Service, Forest Products Lab, Madison, WI. Collins, W., Fischetti, D., (1996). "Recreational timber bridges in Pennsylvania state parks and forests," National conference on wood transportation structures 401-410, USDA, Forest Service, Forest Products Lab, Madison, WI. Hosteng, T., Phares, B., Ritter, M., Wipf, T., Wood, D., (2004). "Live Load Deflection of Timber Bridges," USDA, Forest Service, Forest Products Lab, Madison, WI. Ritter, M., Wacker, J., (1995). "Field performance of stress- laminated timber bridges," Wood Design Focus, 6(2), 10-Mar, USDA, Forest Service, Forest Products Lab, Madison, WI. National Wood in Transportation Program, (2001). "Petty Creek Bridge, Missoula County, Montana." Green, W., McDonald, K., Ross, R., (1994). "Production of hardwood machine stress rated lumber," Proceedings of the 9th International Symposium on Nondestructive testing of wood; 1993 September 22-24; Madison, WI 141-150, Forest Products Society, Madison, WI. National Wood in Transportation Program, (1998). "Emily Lake Road Bridge, Houghton County, Michigan." Kainz, J., Landis, E., Le, X., Peterson, M., (1998). "Smart timber bridges for in-situ evaluation," Proceedings SPIE, Vol. 3396. 0277-786X, 12-Jan.
Phares, B., Wipf, T., (2005). "Development and Demonstration of Fleet Management Strategies for Timber Bridges," USDA, Forest Service, Forest Products Lab, Madison, WI. Bunnell, S., Faller, R., Ritter, M., Rosson, B., Sicking, D., (1995). "Design and evaluation of two bridge railings for low-volume roads," Proceedings of 6th International conference on low-volume roads, Vol. 2, 357-372, National Academy Press, Washington, DC. Winandy, J., (1996). "Effects of treatment, incising, and drying on mechanical properties of timber," National conference on wood transportation structures, FPL-GTR-94, 178-185, USDA, Forest Service, Forest Products Lab, Madison, WI. Rammer, D., (1996). "Shear strength of glued-laminated timber beams and panels," National conference on wood transportation structures, FPL-GTR-94, 192-200, USDA, Forest Service, Forest Products Lab, Madison, WI. Forest Products Lab, (2001). "Crossings, Issue 39," 39 USDA, Forest Service, Forest Products Lab, Madison, WI. Forest Products Lab, (1994). "Crossings, Issue 17," 17 USDA, Forest Service, Forest Products Lab, Madison, WI. Duwadi, S., Faller, R., Ritter, M., (1999). "Crashworthy railing for timber bridges," Forest Research Bulletin: Proceedings of the Pacific Timber Engineering Conference, No. 212. Vol. 3, 325-332, New Zealand Forest Research Institute, Rotorua, New Zealand. Brashaw, B., Ross, R., Vatalaro, R., Wacker, J., (2005). "Condition Assessment of Timber Bridges: 1. Evaluation of a micro-drilling resistance tool," FPL-GTR-159, 12-Jan, USDA, Forest Service, Forest Products Lab, Madison, WI. Altimore, F., Caccese, V., Dagher, H., Ritter, M., (2001). "Field performance of timber bridges: 19. North Yarmouth stress-laminated truss bridge," FPL-RP-590, 19-Jan, USDA, Forest Service, Forest Products Lab, Madison, WI. Amrhein, W., Baughman, D., Hartle, R., Tkacs, J., Wilson III, K., (1991). "Bridge Inspector’s Training Manual 90," FHWA-PD-91-015, 1-586, FHWA - Federal Highway Administration, Washington, DC. Jackson, G., Paun, D., (2000). "Potential for ExpandingSmall-Diameter TimberMarket: Assessing Use of Wood Posts in Highway Applications," FPL-GTR-120, 28-Jan, USDA, Forest Service, Forest Products Lab, Madison, WI. Hill, C., Kainz, J., (1996). "McCurdy Road stress-laminated timber bridge: A viable option for short-span design," National conference on wood transportation structures, FPL-GTR-94, 418-426, USDA, Forest Service, Forest Products Lab, Madison, WI. Lee, P., Ritter, M., Wacker, J., (1996). "Field performance of timber bridges: 10. Sanborn Brook stress-laminated deck bridge," FPL-RP-555, 19-Jan, USDA, Forest Service, Forest Products Lab, Madison, WI. National Wood in Transportation Program, (1999). "Portable Logging Bridge, Michigan." Hislop, L., (1998). "Field performance of timber bridges: 15. Pueblo County, Colorado, stress-laminated deck bridge," FPL-RP-556, 19-Jan, USDA, Forest Service, Forest Products Lab, Madison, WI. Green, D., McDonald, K., (1993). "Investigation of the mechanical properties of red oak 2 by 4’s," Wood and Fiber Science, 25(1), 35-45, USDA, Forest Service, Forest Products Lab, Madison, WI. Goble, G., Hannigan, P., Likins, G., Rausche, F., Thendean, G., (1997). "Design and Construction of Driven Pile Foundations: Workshop Manual Volume II," FHWA-HI-97-014, 1-404, FHWA - Federal Highway Administration, Washington, DC. National Wood in Transportation Program, (2000). "Improving Access to Rural Residential Homes in West Virginia." National Wood in Transportation Program, (1999). "Baileyville Bridge, Centre County, Penn.."
Crawford, D., De Groot, R., Felton, C., (2000). "Distribution of borates around point source injections in wood members exposed outside," FPL-RN-0275, 5-Jan, USDA, Forest Service, Forest Products Lab, Madison, WI. Altimore, F., Caccese, V., Dagher, H., Ritter, M., (2000). "Field performance of timber bridges: 18. Byron stress-laminated truss bridge," FPL-RP-588, 20-Jan, USDA, Forest Service, Forest Products Lab, Madison, WI. Puckett, J., Thomas, W., (1996). "Analysis, design, rating, and drafting of wood bridge superstructures," National conference on wood transportation structures, FPL-GTR-94, 361-370, USDA, Forest Service, Forest Products Lab, Madison, WI. Csagoly, P., Taylor, R., (1986). "A Structural Wood System for Highway Bridges," SRR-80-05, 26-Jan, Ontario Ministry of Transportation and Communication, Downsview, Ontario. Davalos, J., GangaRao, H., Hernandez, R., Moody, R., Sonti, S., (1994). "Bulb-T and glulam FRP beams for timber bridges," Structures Congress 1994: Structures Congress 12: Proceedings of papers presented at the structures congress '94; 1994 April 24-28; Atlanta, GA, 2, 1316-1321, ASCE - American Soceity of Civil Engineers, New York, NY. Becker, J., Brown, N., Ritter, M., Stanfill-McMillan, K., Wacker, J., (1997). "Field performance of timber bridges: 11. Spearfish Creek stress-laminated box-beam bridge," FPL-RP-556, 17-Jan, USDA, Forest Service, Forest Products Lab, Madison, WI. Golston, S., Hilbrich Lee, P., Hinds, K., Ritter, M., (1997). "Field performance of timber bridges: 14. Dean, Hibbsville, and Decatur stress-laminated deck bridges," FPL-RP-564, 21-Jan, USDA, Forest Service, Forest Products Lab, Madison, WI. National Wood in Transportation Program, (1998). "Brookston Road Bridge, Forest County, Pennsylvania." Lee, P., Ritter, M., Triche, M., (1995). "Standard plans for Southern Pine bridges," FPL-GTR-94, 26-Jan, USDA, Forest Service, Forest Products Lab, Madison, WI. Forest Products Lab, (2002). "Crossings, Issue 42," 42 USDA, Forest Service, Forest Products Lab, Madison, WI. Amburgey, T., (2008). "Insects That Infest Seasoned Wood in Structures," Development of Commercial Wood Preservatives, Chapter 3, 32-57, American Chemical Society, Washington, DC. Kurian, A., (2001). "Finite element analysis of longitudinal glulam timber deck and glulam timber girder bridges," 1-177, Iowa State University, Ames, IA. Martinson, K., Wipf, T., (2009). 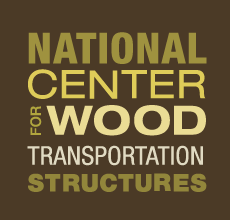 "Establishment of a National Center for Wood Transportation Structures (NCWTS) Phase I," USDA, Forest Service, Forest Products Lab, Madison, WI. Patel, N., Taylor, R., (1986). "Load Testing and Analysis of Wood Bridges Rehabilitated by Transverse Post-Tensioning," SRR-86-08, 29-Jan, Ontario Ministry of Transportation and Communication, Downsview, Ontario. Ritter, M., (1998). "Emerging timber bridge technology in the United States (abstract)," Structural Engineering World Wide [Abstracts Volume], Paper reference T134-1, 8-Jan, Elsevier Science Ltd.
Dagher, H., Hetherly, P., (1996). "The modern timber bridge program in the state of Maine: A five-year report," National conference on wood transportation structures, FPL-GTR-94, 328-332, USDA, Forest Service, Forest Products Lab, Madison, WI. Forest Products Lab, (1992). "Crossings, Issue 10," 10 USDA, Forest Service, Forest Products Lab, Madison, WI. Smith, R., Stanfill-McMillan, K., (1996). "Perception versus reality: An analysis of timber bridge performance in the United States," National conference on wood transportation structures, FPL-GTR-94, 467-475, USDA, Forest Service, Forest Products Lab, Madison, WI. Cerut, B., Petkovic, L., Srpcic, J., Velechovsky, T., (1993). "Curved Glulam Beams In Changing Relative Humidity," Jan-92, Institute for Testing and Research in Materials and Structures, Ljubljana, Slovenia. Abdel-Magid, B., Dagher, H., Kimball, T., Shaler, S., (1996). "Effect of FRP reinforcement on low grade eastern hemlock glulams," National conference on wood transportation structures, FPL-GTR-94, 201-214, USDA, Forest Service, Forest Products Lab, Madison, WI. National Wood in Transportation Program, (2001). "Sunset Hill Road Bridge, Missoula County, Montana." National Wood in Transportation Program, (1998). "Meigsville Township 150 Bridge, Morgan County, Ohio." Kropf, F., (1996). "Durability and detail design – The result of 15 years of systematic improvements," National conference on wood transportation structures, FPL-GTR-94, 321-327, USDA, Forest Service, Forest Products Lab, Madison, WI. Crawford, D., De Groot, R., (1996). "Evaluation of new creosote formulations," National conference on wood transportation structures, FPL-GTR-94, 379-388, USDA, Forest Service, Forest Products Lab, Madison, WI. Bryden, J., Ray, M., (1992). "Summary Report on Selected Guardrails," FHWA-SA-91-050, Jan-39, FHWA - Federal Highway Administration, State & Local Program Branch, Washington, DC. Monlux, S., Vachowski, B., (1995). "Geosynthetics for Tails in Wet Areas," 9523-2839-MTDC, 17-Jan, USDA, Forest Service, Technology & Development Program, Missoula, MT. Graham, J., (1996). "Design of timber foundation piling for highway bridges and other structures," National conference on wood transportation structures, FPL-GTR-94, 301-312, USDA, Forest Service, Forest Products Lab, Madison, WI. Ritter, M., Wipf, T., Wood, D., (2000). "Evaluation and Field Load Testing of a Timber Railroad Bridge," Transportation Research Record 1696, Paper No. 5B0112 Vol. 1, 323-333, Transportation Research Board, National Research Council, Washington, DC. De Groot, R., Gardner, D., Hassler, C., Slahor, J., (1997). "Preservative treatment evaluation of red maple and yellow poplar with ACQ-B," Forest Products Journal, 47(4), 50-54. Brooks, K., (2000). "Assessment of the environmental effects associated with wooden bridges preserved with creosote, pentachlorophenol, or chromated copper arsenate," FPL-RP-587, 1-100, USDA, Forest Service, Forest Products Lab, Madison, WI. Calil, Jr., C., Wacker, J., (2002). "Load Testing of the Laurel Run Prestressed Timber Bridge, USA (in Portugese)," Proceedings of the VIII EBRAMEM, EB051.09 Uberlandia, Minas Gerias, Brazil. Wiest, R., (1998). "A Landowner’s Guide to Building Forest Access Roads," NA-TP-06-98, Jan-45, USDA, Forest Service, Northeastern Area, Morgantown, WV. Taylor, R., (1983). "Design of Prestressed Wood Bridges Using the Ontario Highway Bridge Design Code," SRR-83-03, 29-Jan, Ministry of Transportation and Communications, Downsview, Ontario. Forest Products Lab, (1997). "Crossings, Issue 28," 28 USDA, Forest Service, Forest Products Lab, Madison, WI. National Wood in Transportation Program, (1999). "Old Vanderbilt Road Bridge, Ostego County, MI." Falk, R., Lavinder, J., Pellerin, R., Ross, R., Volny, N., (1996). "In-place detection of decay in timber bridges – An application of stress wave technology," National conference on wood transportation structures, FPL-GTR-94, 282-291, USDA, Forest Service, Forest Products Lab, Madison, WI. Erickson, J., Forsman, J., Morison, G., Ross, R., Wacker, J., Wang, X., (2005). "Nondestructive Assessment of Single Span Timber Bridges using a Vibration Method," Res. Pap. FPL-RP-627, 15-Jan, USDA, Forest Service, Forest Products Lab, Madison, WI. GangaRao, H., Howser, V., Ward, R., Zelinka, S., (1987). "The Development of Economical Low-Volume Road Bridges," DOT FHWA/DF/87/002, 1-159, FHWA - Federal Highway Administration, Washington, DC. Duwadi, S., Faller, R., Lee, P., Ritter, M., Rosson, B., (1996). "Railing systems for longitudinal timber deck bridges," National conference on wood transportation structures, FPL-GTR-94, 145-157, USDA, Forest Service, Forest Products Lab, Madison, WI. Ritter, M., Stanfill-McMillan, K., Wacker, J., (1993). "Development and evaluation of the Teal River stress- laminated glulam bridge," Transportation Research Record 1426 27-35, Transportation Research Board, National Research Council, Madison, WI. Forest Products Lab, (1987). "Wood Handbook: Wood as an Engineering Material – 1987," 72, 1-466, USDA, Forest Service, Forest Products Lab, Madison, WI. Keliher, K., Murphy, G., Ritter, M., Taylor, S., Thompson, J., (1993). "Portable timber bridge designs for low volume forest roads," ASAE Paper 93-7511, 14-Jan, American Society of Agricultural Engineers, St. Joseph, MI. Kainz, J., Porter, G., Ritter, M., (1996). "Field performance of timber bridges: 5. Little Salmon Creek stress-laminated deck bridge," FPL-RP-547, 15-Jan, USDA, Forest Service, Forest Products Lab, Madison, WI. National Wood in Transportation Program, (2002). "Westvaco Natural Resource Center Timber Bridge, Preston County, West Virginia." Faller, R., Ritter, M., Rosson, B., (1995). "Performance level 2 and test level 4 bridge railings for timber decks," Transportation Research Record 1500 102-111, Transportation Research Board, Washington, DC. Blankenhorn, P., Janowiak, J., Labosky Jr., P., Manbeck, H., Witmer, Jr., R., (1996). "Performance of red oak and red maple glued-laminated bridges," National conference on wood transportation structures, FPL-GTR-94, 82-91, USDA, Forest Service, Forest Products Lab, Madison, WI. Duwadi, S., Faller, R., Ritter, M., (1995). "Crash-tested bridge railings for timber bridges," Proceedings of 4th International bridge engineering conference; 1995 August 28-30; San Francisco, CA, Vol. 2, 395-404, National Academy Press, Washington, DC. Blankenhorn, P., Hernandez, R., Janowiak, J., Labosky Jr., P., Manbeck, H., Moody, R., (1993). "Red maple glulam timber beam performance," FPL-RP-519, 30-Jan, USDA, Forest Service, Forest Products Lab, Madison, WI. Forest Products Lab, (1998). "Crossings, Issue 30," 30 USDA, Forest Service, Forest Products Lab, Madison, WI. Kainz, J., (1998). "Field performance of timber bridges: 16. North Siwell Road stress-laminated bridge," FPL-RP-560, 17-Jan, USDA, Forest Service, Forest Products Lab, Madison, WI. Sprinkel, M., (1978). "Glulam Timber Deck Bridges," VHTRC 79-R26, Jan-33, Virginia Highway & Transportation Research Council, Charlottesville, VA.
National Wood in Transportation Program, (1999). "Little Bitterroot River Timber Bridge, Sanders County, Montana." Catherman, S., Wacker, J., Winnet, R., (1998). "Field performance of timber bridges: 12. Christian Hollow stress-laminated box-beam bridge," FPL-RP-560, 17-Jan, USDA, Forest Service, Forest Products Lab, Madison, WI. Buckwalter, L., Cesa, E., Collins, W., Diehl, B., Fischetti, D., Graton, A., Kemp, E., Lichvar, L., McNamara, J., Petro, S., Stoltz, E., Wacker, J., (2005). "Kings Covered Bridge Rehabilitation," Structures Congress 2005: Proceedings of the 2005 Structures Congress ASCE - American Soceity of Civil Engineers, New York, NY. Dimakis, A., Oliva, M., Ritter, M., (1992). "Behavior of stress-laminated parallel-chord timber bridge decks," FPL-RP-511, 19-Jan, USDA, Forest Service, Forest Products Lab, Madison, WI. McLean, D., Rammer, D., (1996). "Shear strength of wood beams," National conference on wood transportation structures, FPL-GTR-94, 168-177, USDA, Forest Service, Forest Products Lab, Madison, WI. Lebow, P., Tippie, M., (2001). "Guide for minimizing the effect of preservative-treated wood on sensitive environments," FPL-GTR-122, 18-Jan, USDA, Forest Service, Forest Products Lab, Madison, WI. Bratkovich, S., (2001). "Utilizing Municipal Trees: Ideas From Across the Country," NA-TP-06-01, Jan-91, USDA, Forest Service, Northeastern Area State and Private Forestry, St. Paul, MN. Ritter, M., (1990). "Development of stress-laminated concepts for timber bridges," Structures Congress 1990: Abstracts: 8th Structures Congress Proceedings; 1990 April 30; Baltimore, MD 179-180, ASCE - American Soceity of Civil Engineers, New York, NY. Forest Products Lab, (1995). "Crossings, Issue 19," 19 USDA, Forest Service, Forest Products Lab, Madison, WI. National Wood in Transportation Program, (2001). "Provo River Pedestrian Covered Bridge, Wasatch County, Utah." National Wood in Transportation Program, (2000). "American Farmland Trust Timber Bridge, Franklin County, Pennsylvania." Bahri, S., (1997). "Static behavior of glued laminated stringer bridges," Jan-92, Iowa State University, Ames, IA. Ritter, M., Ross, R., Schad, K., (1996). "Determining in-place modulus of elasticity of stress-laminated timber decks using NDE," National conference on wood transportation structures, FPL-GTR-94, 277-281, USDA, Forest Service, Forest Products Lab, Madison, WI. Allotey, I., Dolan, J., (1996). "A built-up timber girder for bridge construction in developing countries," National conference on wood transportation structures, FPL-GTR-94, 131-137, USDA, Forest Service, Forest Products Lab, Madison, WI. Ireland, H., Peck, R., (1957). "Backfill Guide," Journal of the Stuctural Division Proceedings of the American Society of Civil Engineers, Paper 1321, 10-Jan, ASCE - American Soceity of Civil Engineers, Jackson, Mississippi. Phares, B., Wipf, T., (2005). "Development of a Smart Glued-Laminated Timber Bridge," USDA, Forest Service, Forest Products Lab, Madison, WI. Elleby, H., Klaiber, W., Reeves, M., Sanders, Jr., W., (1975). "Ultimate Load Behavior of Full-Scale Highway Truss Bridges: Phase IIService Load and Supplementary Tests," HR-169, Jan-96, Iowa State Highway Commission, Ames, IA. Langlitz, T., (1997). "Probabilistic Structural Evaluation of Stress-Laminated Timber Deck Bridges," Jan-62, Iowa State University, Ames, IA. Forest Service Engineering Staff, (1984). "Standard Specifications for Construction of Trails," EM-7720-102, 1-105, USDA, Forest Service, Engineering Staff, Washington, DC. National Wood in Transportation Program, (1999). "Oak Drive Bridge, Stark County, Ohio." Halverson, S., Lebow, S., Morrell, J., Simonsen, J., (2000). "Role of construction debris in release of copper, chromium, and arsenic from treated wood structures," FPL-RP-584, 6-Jan, USDA, Forest Service, Forest Products Lab, Madison, WI. Dimakis, A., Oliva, M., Ritter, M., (1987). "Development and use of stress laminated timber deck bridges," Structures Congress 1987: Bridges and transmission line structures: Proceedings of the Structures Congress '87; 1987 August 17-20; Orlando, FL 249-255, ASCE - American Soceity of Civil Engineers, New York, NY. Giesecke, F., Hill, C., Mitchell, A., Spencer, H., (1974). "Technical Drawing Sixth Edition," 0-02-342700-0, 1-867, Macmillan Publishing Co., New York, NY. Gutkowski, R., McCutcheon, W., Moody, R., (1986). "Performance and rehabilitation of timber bridges," Transportation Research Record 1053 65-69, Transportation Research Board, National Research Council, Washington, DC. Bejune, J., Cesa, E., Strothers, M., (2004). "Portable Timber Bridges as a Best Management Practice in Forest Management," NA-TP-04-04, 1-166, USDA, Forest Service, Northeastern Area, NWTIC, Morgantown, WV. Hassler, C., Hawkins, J., McDonald, K., Pahl, T., (1996). "Hardwood structural lumber from log heart cants," Forest Products Journal, 46(6), 55-62. Miller, W., (1978). "Crosscut Saw Manual," 7771 2508, 27-Jan, USDA, Equipment Development Center, Missoula, MT. Geiger, G., Schnepp, R., (1989). "Passerelle haubanee en bois rond sur la N9," Journal de la Construction, No 21 Journal de la Construction, Quebec, Canada. Hallman, R., (1997). "Handtools for Trail Work," 8823-2601-MTDC, Jan-54, USDA, Forest Service, Technology & Development Program, Missoula, MT. Transportation Research Board, (1980). "Bridges on Secondary Highways and Local Roads Rehabilitation and Replacement," 222, 1-132, Transportation Research Board, Washington, DC. Duwadi, S., Ritter, M., (1997). "Timber bridges in the United States," Public Roads, 60(3) Winter 1997, 32-40, FHWA - Federal Highway Administration, Washington, DC. Transportation Research Board, (1981). "Rehabilitation and Replacement of Bridges on Secondary Highways and Local Roads," 243, Jan-46, Transportation Research Board, Washington, DC. Clausen, C., (2009). "Naturally Durable Wood Species for Repair and Rehabilitation of Aboveground Components in Covered Bridges," USDA, Forest Service, Forest Products Lab, Madison, WI. Ritter, M., Smith, M., Wipf, T., (1999). "Stress-laminated SCL bridges with preservative strand," Forest Research Bulletin: Proceedings of the Pacific Timber Engineering Conference, No. 212 Vol. 3, 47-54, USDA, Forest Service, Forest Products Lab, Madison, WI. Ritter, M., (1990). "Timber bridges: Design, construction, inspection, and maintenance," EM 7700-8, 1-944, USDA, Washington, DC. McFarland, W., Olson, R., Post, E., (1970). "Tentative Service Requirements for Bridge Rail Systems," 86, Jan-62, Transportation Research Board, National Research Council, Washington, DC. Forest Service Engineering Staff, (1990). "The History of Engineering in the Forest Service: A Compilation of History and Memoirs, 1905-1989," EM 7100-13, 1-803, USDA, Forest Service, Engineering Staff, Washington, DC. Falk, R., Pellerin, R., Ross, R., Salsig, W., Volny, N., (1999). "Inspection of Timber Bridges Using Stress Wave Timing Nondestructive Evaluation Tools–A Guide for Use and Interpretation," FPL-GTR-114, 15-Jan, USDA, Forest Service, Madison, WI. Blankenhorn, P., Hernandez, R., Janowiak, J., Labosky Jr., P., Manbeck, H., Moody, R., (1992). "Performance of red maple glulam timber beams," ASAE Paper, 92-4555, 14-Jan, American Society of Agricultural Engineers, St. Joseph, MI. Albrecht, P., Flournoy, T., Graber, D., Harland, J., Purvis, R., (1986). "Inspection of Fracture Critical Bridge Members," FHWA-IP-86-26, 1-236, FHWA Office of Implementation, McLean, VA.
Brashaw, B., Ross, R., Vatalaro, R., Wacker, J., Wang, X., (2005). "Development of Flexural Vibration Inspection Techniques to Rapidly Assess the Structural Health of Timber Bridge Systems," Proceedings of the 14th International Symposium on Nondestructive Testing of Wood 110-121 Hannover, Germany. Duwadi, S., Moody, R., Ritter, M., (1996). "Summary of U.S. research on wood transportation structures," Proceedings of the international wood engineering conference, Vol. 1, 81-88, Civil/Environmental E. Louisiana State University, Baton Rouge, LA. Phares, B., Ritter, M., (2009). "Security Manual for Covered Bridges," USDA, Forest Service, Forest Products Lab, Madison, WI. Duwadi, S., Ritter, M., (1998). "Research Accomplishments for Wood Transportation Structures Based on a National Research Needs Assessment," FPL-GTR-105, 30-Jan, USDA, Forest Service, Forest Products Lab, Madison, WI. Ritter, M., Taylor, S., (1990). "Development of longer span wood bridges," Developments in short and medium span bridge engineering '90: Proceedings of the 3rd International conference on short and medium span bridges, Vol. 2, 391-402, The Canadian Society for Civil Engineering, Montreal, P.Q., Canada. Forest Products Lab, (2000). "Crossings, Issue 37," 37 USDA, Forest Service, Forest Products Lab, Madison, WI. Kainz, J., Lee, P., Meyer, C., Ritter, M., (1996). "Evaluation of stress-laminated T-beam bridges constructed of laminated veneer lumber," National conference on wood transportation structures, FPL-GTR-94, 92-103, USDA, Forest Service, Forest Products Lab, Madison, WI. National Wood in Transportation Program, (1999). "East Fork Rosebud Creek Bridge, Carbon County, Montana." National Wood in Transportation Program, (1999). "Trough Creek State Park Bridge, Huntingdon County, Pennsylvania." Eamon, C., Murphy, J., Nowak, A., Ritter, M., (2001). "LRFD Calibration for Wood Bridges," Project 96-RJVA-2822, Jan-56, University of Michigan, College of Engineering, Ann Arbor, MI. Ritter, M., Usuki, S., (1993). "Field tests and development of stress-laminated wood deck bridges," Bulletin of Structural Engineering, 39 A(3), 1089-1100. Holan, J., (1990). "Norwegian Wood: A Tradition of Building," 1-208, Rizzoli, New York, NY. Williamson, T., (1996). "Timber highway bridge construction practices in the United States," National conference on wood transportation structures, FPL-GTR-94, 9-Jan, USDA, Forest Service, Forest Products Lab, Madison, WI. National Wood in Transportation Program, (1999). "Local Bridge No. 1-5, Allegany County, New York." Faller, R., Ritter, M., (1994). "Crashworthy bridge railing for longitudinal wood decks," PTEC 94 Timber shaping the future: Proceedings of Pacific timber industry conference; 1994 July 11- 15; Gold Coast, Australia, Vol. 2, 298-307, Timber Research and Development Advisory Council, Queensland, Australia. Ritter, M., Wipf, T., Wood, D., (1996). "Dynamic evaluation of timber bridges," National conference on wood transportation structures, FPL-GTR-94, 114-121, USDA, Forest Service, Forest Products Lab, Madison, WI. National Wood in Transportation Program, (1999). "Millcross Road Timber Bridge, Lancaster County, Pennsylvania." Taylor, S., (1984). "A Wood Bridge Calibration Study for the OHBDC," SRR-83-04, Jan-37, Ontario Ministry of Transportation and Communications, Downsview, Ontario. Bergman, R., Cai, Z., Carll, C., Clausen, C., Dietenberger, M., Falk, R., Frihart, C., Glass, S., Hunt, C., Ibach, R., Kretschmann, D., Rammer, D., Ross, R., (2010). "Wood Handbook: Wood as an Engineering Material – 2010," GTR-190, 1-509, USDA, Forest Service, Forest Products Lab, Madison, WI. Brashaw, B., Ross, R., Vatalaro, R., Wacker, J., (2005). "Condition Assessment of Timber Bridges: 2. Evaluation of Several Stress-Wave Timer Devices," FPL-GTR-160, 12-Jan, USDA, Forest Service, Forest Products Lab, Madison, WI. Ritter, M., Williamson, T., (1995). "Maintenance practices for wood bridges," Structures Congress 1995: Restructuring: America and beyond: Proceedings of Structures Congress 13; 1995 April 2- 5; Boston, MA, Vol. 1, 290-293, ASCE - American Soceity of Civil Engineers, New York, NY. Forest Products Lab, (2000). "Crossings, Issue 36," 36 USDA, Forest Service, Forest Products Lab, Madison, WI. Green, W., Kretschmann, D., Ross, R., Wolcott, M., (1996). "Mechanical grading of timbers for transportation industry," National conference on wood transportation structures, FPL-GTR-94, 186-191, USDA, Forest Service, Forest Products Lab, Madison, WI. Duwadi, S., Moody, R., Ritter, M., (1994). "U.S. Timber bridge research," PTEC 94 Timber shaping the future: Proceedings of Pacific timber engineering conference; 1994 July 11-15; Gold Coast, Australia, Vol. 2, 148-155, Timber Research and Development Advisory Council, Queensland, Australia. Forest Products Lab, (1992). "Crossings, Issue 7," 7 USDA, Forest Service, Forest Products Lab, Madison, WI. Ericksson, M., Kosmalski, S., Wheeler, H., (2003). "Asphalt Paving of Treated Timber Bridge Decks," 0371-2809-MTDC, 30-Jan, USDA, Forest Service, Technology & Development Program, Missoula, MT. Nowak, A., Saraf, V., (1996). "Reliability analysis of plank decks for bridges," National conference on wood transportation structures, FPL-GTR-94, 225-231, USDA, Forest Service, Forest Products Lab, Madison, WI. Ritter, M., Williamson, T., (1995). "State of the art report: Glulam timber bridge design in the United States," From meeting twenty-seven of the International Council for Building Research Studies and Documentation: Working Commission W18 - Timber Structures 10-Jan Karlsruhe, Germany. Ritter, M., Taylor, S., (1996). "Portable T-section glulam bridge for low-volume roads," National conference on wood transportation structures, FPL-GTR-94, 427-436, USDA, Forest Service, Forest Products Lab, Madison, WI. Green, D., McDonald, K., (1993). "Mechanical properties of red maple structural," Wood and Fiber Science, 25(4), 365-374. Ritter, M., Tice, E., Wacker, J., (1995). "Field performance of timber bridges: 2. Cooper Creek stress-laminated deck bridge," FPL-RP-536, 17-Jan, USDA, Forest Service, Forest Products Lab, Madison, WI. Hernandez, R., Janowiak, J., Manbeck, H., Moody, R., Shedlauskas, J., (1996). "Efficient use of red oak for glued-laminated beams," Transactions of the ASAE, 39 (1), 203-209. Bernecker, C., Boothby, T., Burroughs, C., Cegelka, S., Grgurevich, S., Manbeck, H., Ritter, M., (1996). "Development of wood highway sound barriers," National conference on wood transportation structures, FPL-GTR-94, 158-167, USDA, Forest Service, Forest Products Lab, Madison, WI. Ritter, M., Wacker, J., (1992). "Field performance of timber bridges: 1. Teal River stress-laminated deck bridge," FPL-RP-515, 19-Jan, USDA, Forest Service, Forest Products Lab, Madison, WI. Lebow, P., (2004). "Alternatives to Chromated Copper Arsenate (CCA) for Residential Construction," FPL-RP-618, 9-Jan, USDA, Forest Service, Forest Products Lab, Madison, WI. Hislop, L., (1996). "Portable surfaces for crossing unstable roadbeds," National conference on wood transportation structures, FPL-GTR-94, 138-144, USDA, Forest Service, Forest Products Lab, Madison, WI. National Wood in Transportation Program, (2000). "Flint Creek Timber Bridge, Granite County, Montana." Hislop, L., Morgan, P., Taylor, S., Triche, M., (2002). "Field investigations of stress-laminated T-beam and box-beam timber bridges," Wood Design Focus, Spring 2002. Nowak, A., Ritter, M., (1994). "LRFD provisions for wood bridges," Structures Congress 1994: Structures Congress 12: Proceedings of papers presented at the structures congress '94; 1994 April 24-28; Atlanta, GA, Vol. 1, 549-554, ASCE - American Soceity of Civil Engineers, New York, NY. Crews, K., Dickson, B., GangaRao, H., Ritter, M., (1994). "State of the art research – stress-laminated timber bridge decks Australia and North America," PTEC 94 Timber shaping the future: Proceedings of Pacific timber engineering conference; 1994 July 11-15; Gold Coast, Australia, Vol. 2, 123-130, Timber Research and Development Advisory Council, Fortitude Valley MAC, Queensland, Australia. Lauderdale, X., Lee, P., (1997). "Field performance of timber bridges: 13. Mohawk canal stress-laminated bridge," FPL-RP-563, 18-Jan, USDA, Forest Service, Forest Products Lab, Madison, WI. De Groot, R., Gardner, D., Hassler, C., Slahor, J., (1997). "Preservative treatment evaluation with CCA and ACQ-B of four Applachian wood species for use in timber transportation structures," Forest Products Journal, 47(9), 33-42. National Wood in Transportation Program, (1999). "Lynn Run Trail Bridge #1, Westmoreland County, Pennsylvania." De Groot, R., Wang, J., (1996). "Treatability and durability of heartwood," National conference on wood transportation structures, FPL-GTR-94, 252-260, USDA, Forest Service, Forest Products Lab, Madison, WI. Keliher, K., Ritter, M., Taylor, S., Thompson, J., (1996). "Portable glulam timber bridge systems," Proceedings of the international wood engineering conference, Vol. 2, 368-375, Civil/Environmental E. Louisiana State University, Baton Rouge, LA. Jain, S., (2000). "Analytical modeling and preprocessor development of stress-laminated timber deck bridges," 1-123, Iowa State University, Ames, IA. Rammer, D., Soltis, L., (1994). "Shear strength of unchecked glued-laminated beams," Forest Products Journal, 44(1), 51-57. Feist, W., Williams, R., (1999). "Water Repellents and Water-Repellent Preservatives for Wood," FPL-GTR-109, 12-Jan, USDA, Forest Service, Forest Products Lab, Madison, WI. Crawford, D., Wacker, J., (2003). "Extending the Service Life of Timber Bridges with Preservatives," Proceedings of the 19 th US-Japan Bridge Engineering Workshop: 27-29 October, 2003 Tsukuba, Japan. De Groot, R., Gutting, K., Laks, P., Pickens, J., (1996). "Field performance of new wood preservatives in secondary timber species," National conference on wood transportation structures, FPL-GTR-94, 389-400, USDA, Forest Service, Forest Products Lab, Madison, WI. Cetiner, A., Gunderson, R., Ivey, D., Olson, R., Post, E., (1974). "Bridge Rail Design: Factors, Trends, and Guidelines," 149, Jan-49, Transportation Research Board, National Research Council, Washington, DC. Geske, E., Mason, L., McCutcheon, W., Moody, R., Ritter, M., Wacker, J., (1990). "Performance of stress-laminated bridges," Wood Design Focus, 1(3), 16-Dec, USDA, Forest Service, Forest Products Lab, Madison, WI. Kainz, J., Nelson, M., Wacker, J., (1996). "Field performance of timber bridges: 9. Big Erick’s stress-laminated deck bridge," FPL-RP-552, 24-Jan, USDA, Forest Service, Forest Products Lab, Madison, WI. Bisat, A., (1996). "Analytical modeling of longitudinal glued laminated timber deck bridges," Jan-66, Iowa State University, Ames, IA. Otter, D., Ritter, M., Rogers, P., Wipf, T., (1996). "Superstructure load path testing of two open-deck timber bridges," TD 96(027) TDAAR Railway Technology Department, Madison, WI. Kainz, J., Ritter, M., Wacker, J., (1998). "In situ performance of stress-laminated timber bridge decks," Proceedings of the Society for Experimental Mechanics, Inc., spring conference on experimental and applied mechanics 265-268, USDA, Forest Service, Forest Products Lab, Houston, TX. Lebow, P., Rammer, D., Soltis, L., (1996). "Experimental shear strength of unchecked solid-sawn Douglas-fir," FPL-RP-553, Jan-33, USDA, Forest Service, Forest Products Lab, Madison, WI. Bakht, B., Bolshakova, T., Maheu, J., (1996). "Stressed Log Bridges," Canadian Journal of Civil Engineering, 23:02, 490-501, Ontario Ministry of Transportation, Downsview, Ontario. Taylor, R., (1987). "Applications in Prestressed Wood," SRR-87-07, 25-Jan, Ministry of Transportation and Communications, Downsview, Ontario. Franklin, R., Morgan, P., Ritter, M., Taylor, S., (1997). "Performance of portable T-section glulam timber bridges," 1997 ASAE Annual International Meeting Minneapolis, MN. Gehri, E., (1985). "Holzbrucken fur Feld – und Waldstrassen Die QS-Holzplattenbruke," Switzerland. Lee, P., Ritter, M., Tice, E., (1996). "Eastern cottonwood stress-laminated timber bridges: Enhancing rural America with underutilized species," National conference on wood transportation structures, FPL-GTR-94, 104-113, USDA, Forest Service, Forest Products Lab, Madison, WI. National Wood in Transportation Program, (1998). "Huntsman Road Bridge, Richland County, Ohio." Forest Products Lab, (2000). "Crossings, Issue 38," 38 USDA, Forest Service, Forest Products Lab, Madison, WI. Brashaw, B., Ross, R., (2009). "Use of Laser Scanning Technology to Obtain As-Built Records of Historic Covered Bridges," USDA, Forest Service, Forest Products Lab, Madison, WI. Baileys, R., Blankenhorn, P., Janowiak, J., Labosky Jr., P., Manbeck, H., Webb, D., (1996). "Wood preservation — Preservative treatment for hardwood glued-laminated bridges," National conference on wood transportation structures, FPL-GTR-94, 261-269, USDA, Forest Service, Forest Products Lab, Madison, WI. Altimore, F., Caccese, V., Dagher, H., Ritter, M., (2001). "Field Performance of Timber Bridges: 20. Gray Stress-Laminated Deck Bridge," FPL-RP-592, 15-Jan, USDA, Forest Service, Forest Products Lab, Madison, WI. Bidigalu, G., GangaRao, H., Halabe, U., Ross, R., (1996). "Nondestructive evaluation of green lumber using stress wave and transverse vibration techniques," Proceedings, Review of Progress in Quantitative Nondestructive Evaluation, Vol. 15, 1891-1894, Plenum Press, New York, NY. Forest Products Lab, (1995). "Crossings, Issue 18," 18 USDA, Forest Service, Forest Products Lab, Madison, WI. Bronstad, M., Calcote, L., Mayer, Jr., J., Ray, M., (1988). "Guardrail-Bridge Rail Transition Designs, Vol. I: Research Report," FHWA-RD-86-178, 1-168, Turner-Fairbank Highway Research Center, McLean, VA.
McCutcheon, W., Tuomi, R., (1974). "Simplified design procedure for glued-laminated bridge decks," FPL-RP-233, 8-Jan, USDA, Forest Service, Forest Products Lab, Madison, WI. Prellwitz, R., (1980). "Deadman Anchoring Guide," ETR-7100-7, Jan-35, USDA, Forest Service, Washington, DC. Davalos, J., Hernandez, R., Kim, Y., Moody, R., Sonti, S., (1997). "Strength and stiffness of reinforced Yellow-Poplar glued laminated beams," FPL-RP-554, 28-Jan, USDA, Forest Service, Forest Products Lab, Madison, WI. State of California Highway Transportation Agency, (1963). "Manual of Bridge Design Practice," State of California, Highway Transportation Agency, Highway Div, Bridge Dpt, California. Oliva, M., Ritter, M., (1990). "Field performance of U.S. stress- laminated wood bridges," Proceedings of the 1990 international timber engineering conference; 1990 October 23-25; Tokyo, Japan, Vol. 2, 564-569, International Timber Engineering Conference, Tokyo, Japan. De Groot, R., Love, C., Morrell, J., Silva, A., (1998). "Field Treatment Systems for Protecting Bridge Memebers," FP-93-2024 Oregon State University, Dept. of Forest Products, Corvallis, OR. Dickson, B., (1995). "Modern Timber Bridges of West Virginia, Volume II," 1-29, 1-53, USDA Forest Service, Morgantown, WV. Cesa, E., Russell, K., (1996). "Wood in Transportation Program, technology transfer efforts," National conference on wood transportation structures, FPL-GTR-94, 340-343, USDA, Forest Service, Forest Products Lab, Madison, WI. Duwadi, S., Faller, R., Ritter, M., Rosson, B., (1999). "Railing systems for use on timber deck bridges," Transportation Research Record 1656, Paper No. 99-1027, 110-119, Transportation Research Board, Washington, DC. Ritter, M., Stanfill-McMillan, K., (1995). "Wood Bridges in New England," Structures Congress 1995: Restructuring: America and beyond: Proceedings of Structures Congress 13; 1995 April 2- 5; Boston, MA, Vol. 1, 1081-1084, ASCE - American Soceity of Civil Engineers, New York, NY. National Wood in Transportation Program, (2001). "High Point Road Timber Bridge, Bay County, Florida." Forest Products Lab, (1998). "Crossings, Issue 32," 32 USDA, Forest Service, Forest Products Lab, Madison, WI. Evans, J., Gorman, T., Green, W., Hatfield, C., Murphy, J., (2005). "Mechanical Grading of 6-Inch-Diameter Lodgepole Pine Logs for the Travelers’ Rest and Rattlesnake Creek Bridges," FPL-RN-297 USDA, Forest Service, Forest Products Lab, Madison, WI. Wacker, J., (2004). "Field Performance of Stress-Laminated Highway Bridges Constructed with Glued Laminated Timber," Structures Congress 2004: Proceedings of the 2004 ASCE Structures Congress Nashville, TN. Forest Products Lab, (1991). "Crossings, Issue 3," 3 USDA, Forest Service, Forest Products Lab, Madison, WI. Krahn, L., McCarthy, M., Oliva, M., Ritter, M., (1988). "Behavior of metal-plate connected joints in creosote treated wood: a pilot study," Forest Products Journal, 38(7/8), 76-80, USDA, Forest Service, Forest Products Lab, Madison, WI. Ritter, M., Wacker, J., (1995). "Field performance of timber bridges: 4. Graves Crossing stress-laminated deck bridge," FPL-RP-539, 17-Jan, USDA, Forest Service, Forest Products Lab, Madison, WI. Mtenga, P., (1996). "Conventional lumber decking: Effect of board sizes," National conference on wood transportation structures, FPL-GTR-94, 239-244, USDA, Forest Service, Forest Products Lab, Madison, WI. Singh, G., (1989). "Advanced Bridge Inspection Methods: Applications and Guidelines," TS-89-017, 1-106, Turner-Fairbank Highway Research Center, McLean, VA.
Emerson, R., Fridley, K., McLean, D., Pellerin, R., Pollock, D., Ross, R., (2002). "Ultrasonic Inspection of Large Bridge Timbers," Forest Products Journal, 52(9), 35-46, Forest Products Society. Calil, Jr., C., Wacker, J., (2004). "Pennsylvania Hardwood Timber Bridges: Field Performance After 10 Years," Proceedings of the 2004 NDE/NDT for Highways and Bridges Conference Columbus, OH: Society of Nondestructive Testing, Buffalo, NY. Forest Products Lab, (1992). "Crossings, Issue 9," 9 USDA, Forest Service, Forest Products Lab, Madison, WI. Erickson, J., Evensen, H., Forsman, J., Ligon, J., Morison, G., Ross, R., Van Karsen, C., (2002). "Timber bridge evaluation: A global nondestructive approach using impact generated FRFs," Proceedings, 20th International Modal Analysis Conference 1567-1573. Moody, R., Ritter, M., Williamson, T., (1994). "Innovations in glulam timber bridge design," Structures Congress 1994: Structures Congress 12: Proceedings of papers presented at the structures congress '94; 1994 April 24-28; Atlanta, GA, Vol. 2, 1298-1303, ASCE - American Soceity of Civil Engineers, New York, NY. Crawford, D., Ericksson, M., Wacker, J., (2003). "Creosote Retention Levels of Timber Highway Bridge Superstructures in Michigan," FPL-RN-289 USDA, Forest Service, Forest Products Lab, Madison, WI. Rammer, D., (2005). "Condition Assessment of In-Service Wood in Bridges and Structures by NIR Spectroscopy," USDA, Forest Service, Forest Products Lab, Madison, WI. Chudnoff, M., (1980). "Tropical Timbers of the World," 1-826, USDA, Forest Service, Forest Products Lab, Madison, WI. Kretschmann, D., (2005). "Crash System Development and Testing of Round Guardrail Posts," USDA, Forest Service, Forest Products Lab, Madison, WI. Forest Products Lab, (2001). "Timber Bridge Economics," FPL-RP-593, Jan-40, USDA, Forest Service, Forest Products Lab, Madison, WI. Dwyer, J., Green, D., McDonald, K., Whipple, J., (1993). "Red Maple stress-graded lumber from factory-grade logs," Forest Products Journal, 43(11/12), 13-18. Nowak, A., Ritter, M., (1995). "Load and resistance factor design code for wood bridges," Proceedings of 4th International bridge engineering conference; 1995 August 28-30; San Francisco, CA, Vol. 2, 351-357, National Academy Press, Washington, DC. Altimore, F., (1995). "Stress Laminated Metal Plate Connected Truss Bridges," 1-359, USDA, Forest Service, Forest Products Lab, Madison, WI. Franklin, R., Morgan, P., Ritter, M., Taylor, S., (1999). "T-Section Glulam Timber Bridge Modules: Modeling and Performance," Presented at the 1999 Annual International Meeting sponsored by ASAE and CSAE-SCGR, Paper No. 99-4207 ASAE, Joseph, MI. Moody, R., Ritter, M., (1991). "Timber bridge research by the US Forest Service, Forest Products Laboratory," Proceedings of the 1991 International Timber Engineering Conference; 1991 September 2-5; London, United Kingdom, Vol. 3, 356-363, Timber Research and Development Association, High Wycombe, United Kingdom. (). "Michigan Vehicular Timber Bridge Commercialization Project," USDA, Forest Service, Forest Products Lab, Madison, WI. Forest Products Lab, (1998). "Crossings, Issue 31," 31 USDA, Forest Service, Forest Products Lab, Madison, WI. Amburgey, T., Barnes, H., Sanders, M., (2006). "Maintaining Wood Highway Structures/Timber Bridges Maintenance and Inspection Manual," 28-Jan, Mississippi St Univ, Forest and Wildlife Research Center, Forest Prod Dept, Mississippi State, MS.
Chen, H., GangaRao, H., He, Y., Ross, R., (1994). "Field evaluations of prestress forces in post- tensioned rods using the dynamic characterization method," Proceedings, Structural Materials Technology, An NDT Conference, Atlantic City, NJ, Feb 23-25. Wilbur Smith Associates, (1994). "Bridge Maintenance Training Manual," FHWA-HI-94-034, I1 - XV36, FHWA - Federal Highway Administration, Washington, DC. Emerson, R., Fridley, K., McLean, D., Peterson, S., Pollock, D., (2000). "Development of Nondestructive Evaluation Methods and Equipment for Wood Transportation Structures," Project No. 96-RJVA-2825, 4-Jan, USDA, Forest Service, Forest Products Lab, Madison, WI. Lee, P., Porter, G., Ritter, M., (1996). "Field performance of timber bridges: 6. Hoffman Run stress-laminated deck bridge," FPL-RP-549, 16-Jan, USDA, Forest Service, Forest Products Lab, Madison, WI. Hosteng, T., J. Wacker, (2015). "Investigation of Glulam Girder Bridges with Composite Concrete Decks," 4719-028 USDA, Forest Service, Forest Products Lab, Madison, WI. Latincsics, T., (1998). "Design and Construction of the Pochuck Quagmire Bridge – A Suspension Timber Bridge," NA-TP-04-97 National Wood in Transportation Information Center, Morgantown, WV. Alabama Forestry Commission, (2008). "Modern Timber Bridges: An Attractive Option," Alabama Forestry Commission, Alabama.